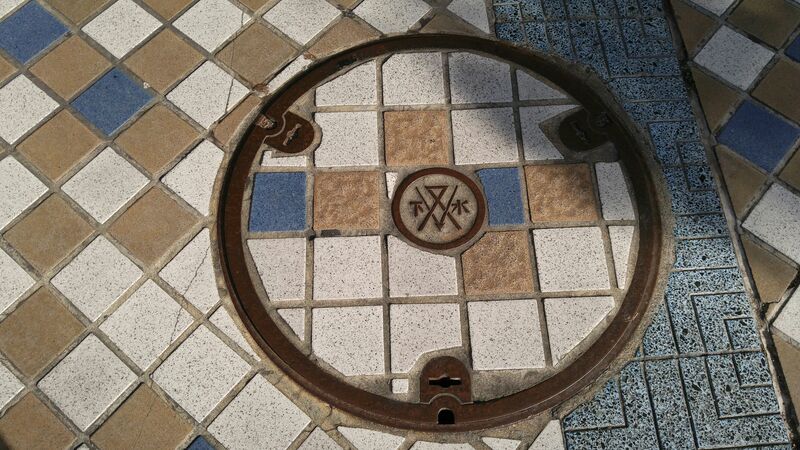 8 bis: New Covers in Atami City! 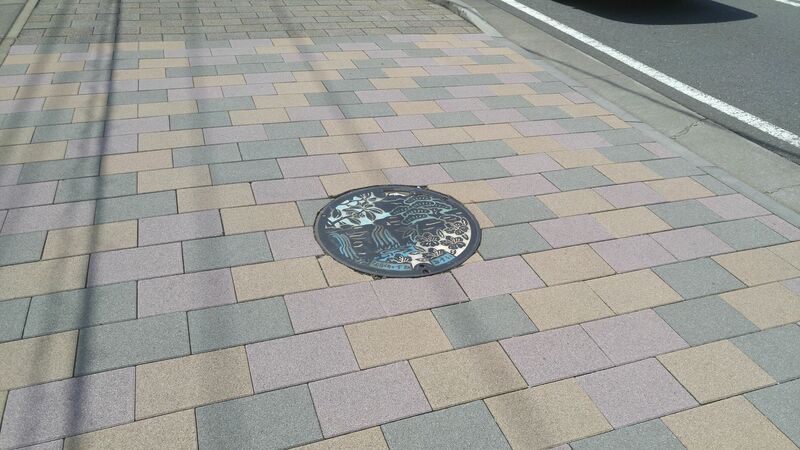 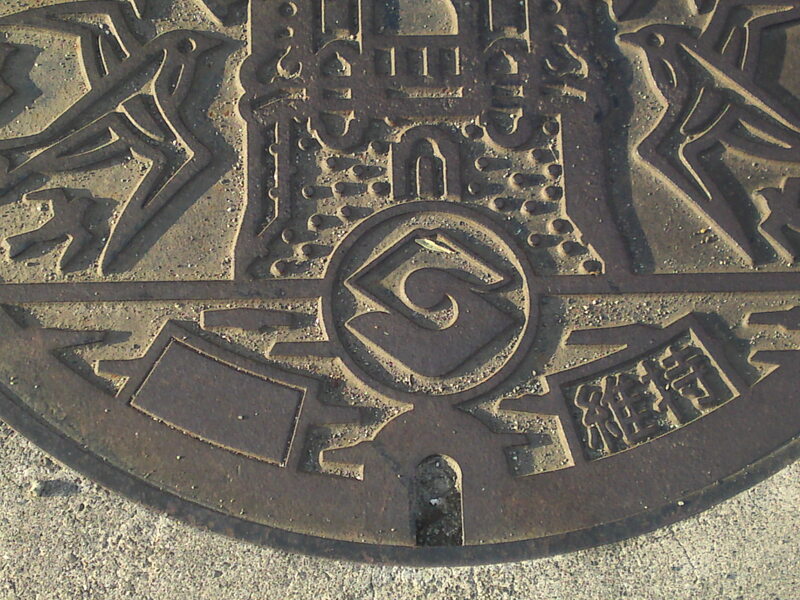 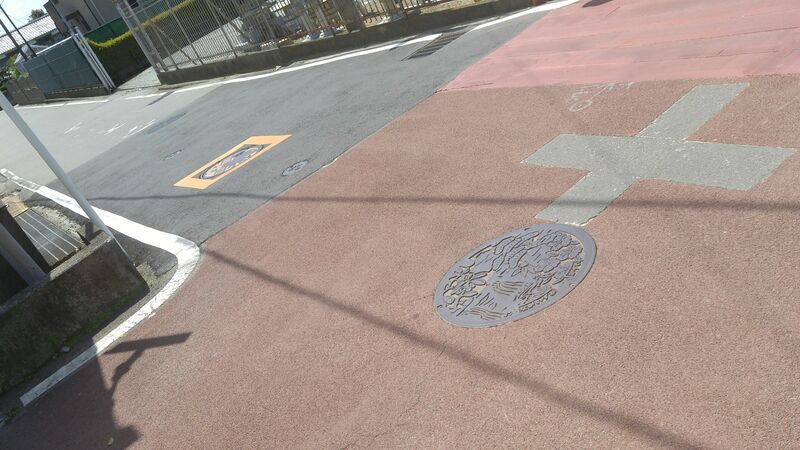 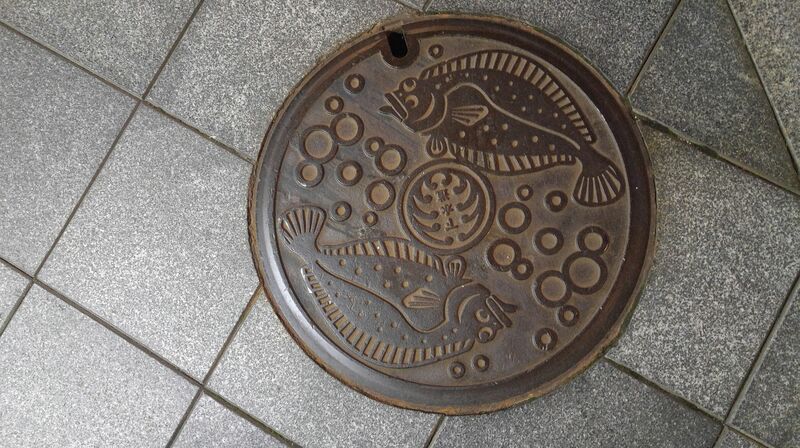 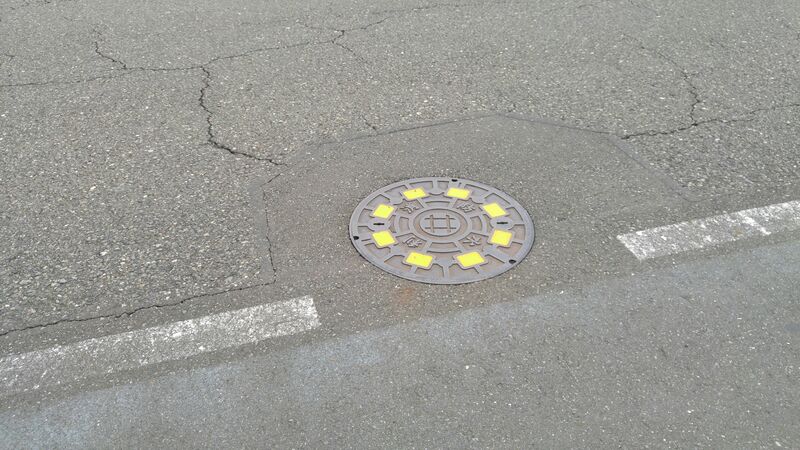 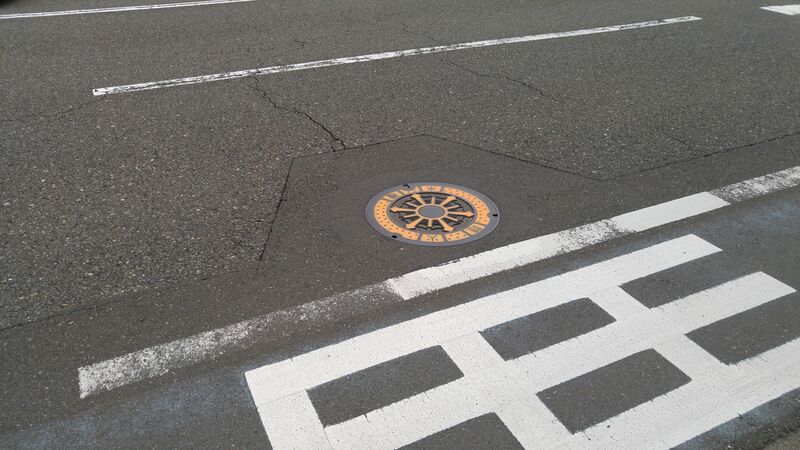 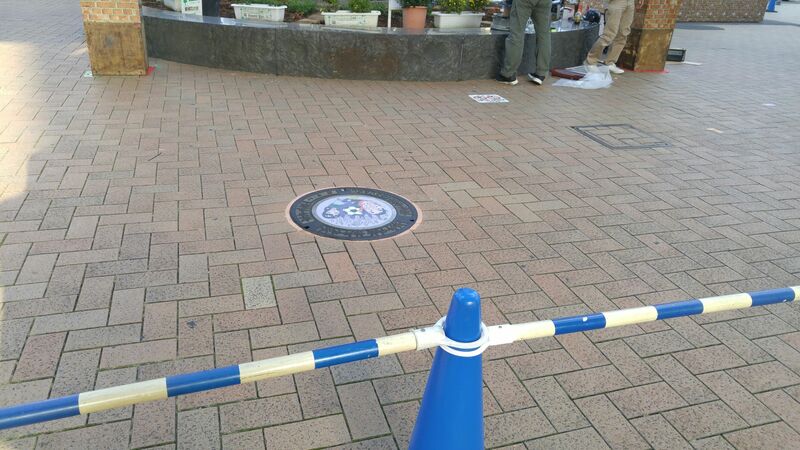 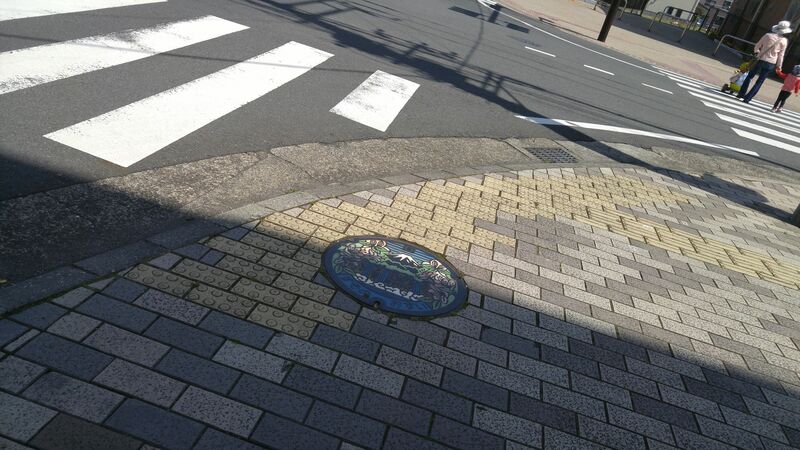 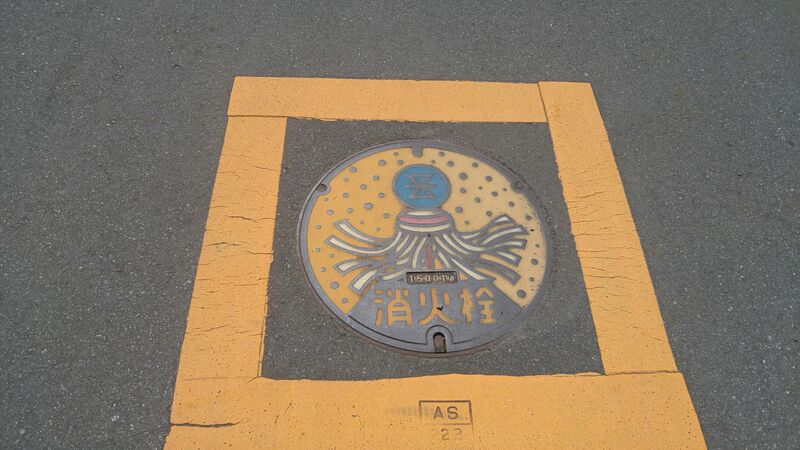 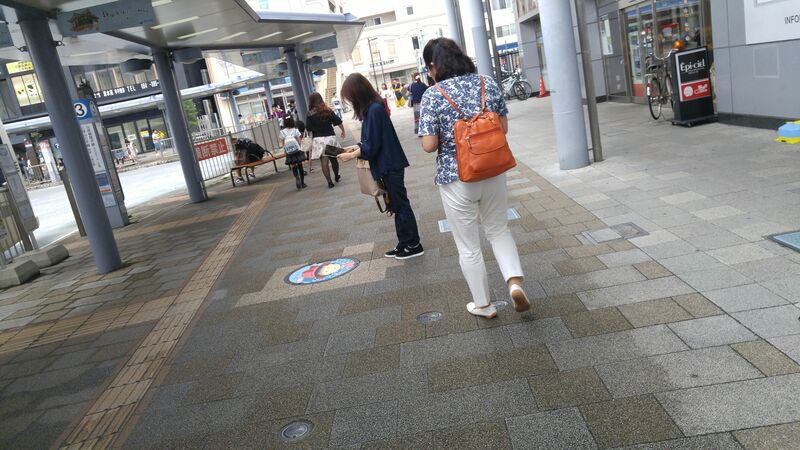 23 bis: Old and New Manhole Covers Roundup in Fujieda City! 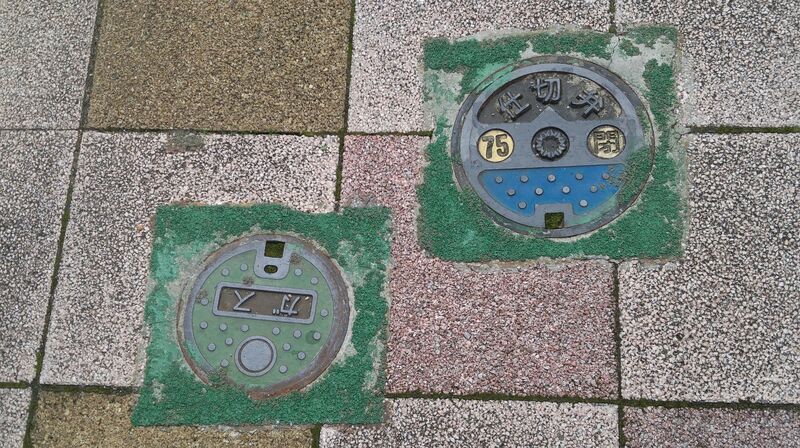 50: New and Old Fire Hydrant and Fire Cistern Covers in Shizuoka City! 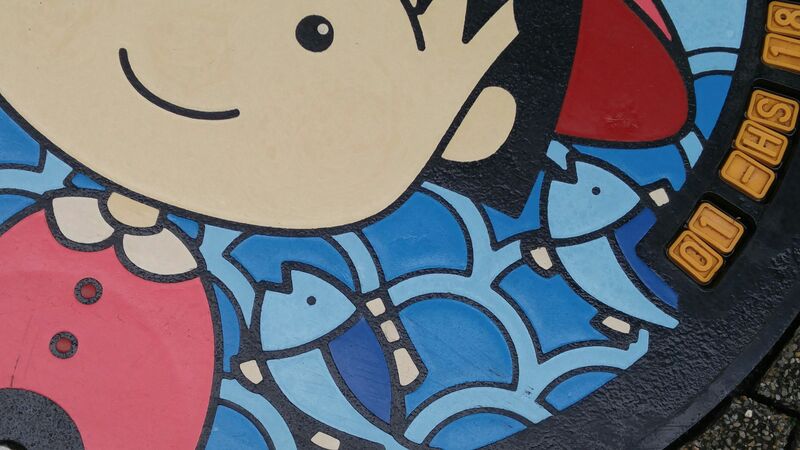 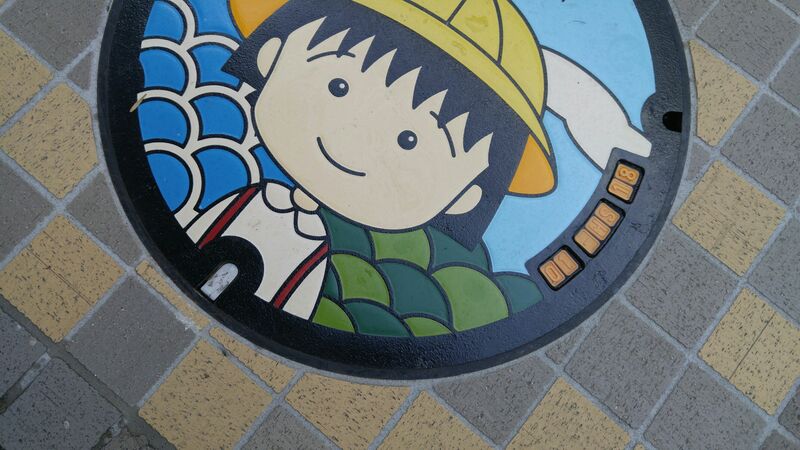 49: Chibi Maruko in Shimizu Ku & Aoi Ku in Shizuoka City! 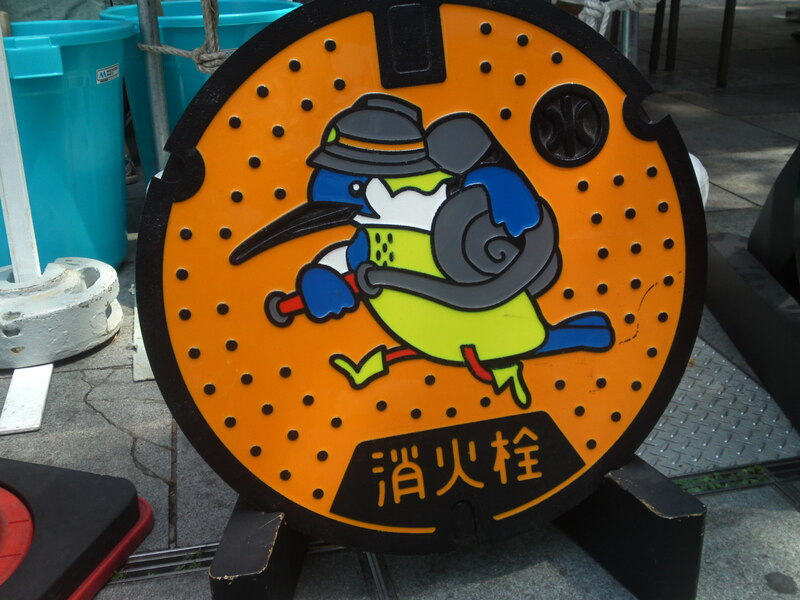 48) New Rescue Kingfishers Cover in Shizuoka City! 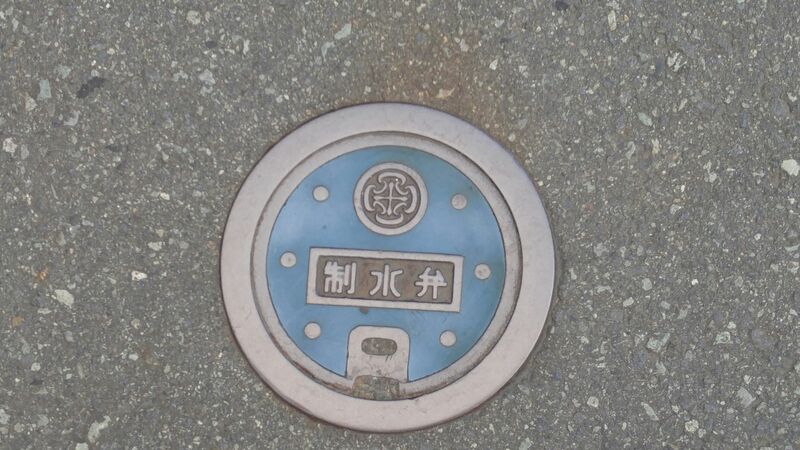 46) “new” and “old” discoveries in Hamamatsu City! 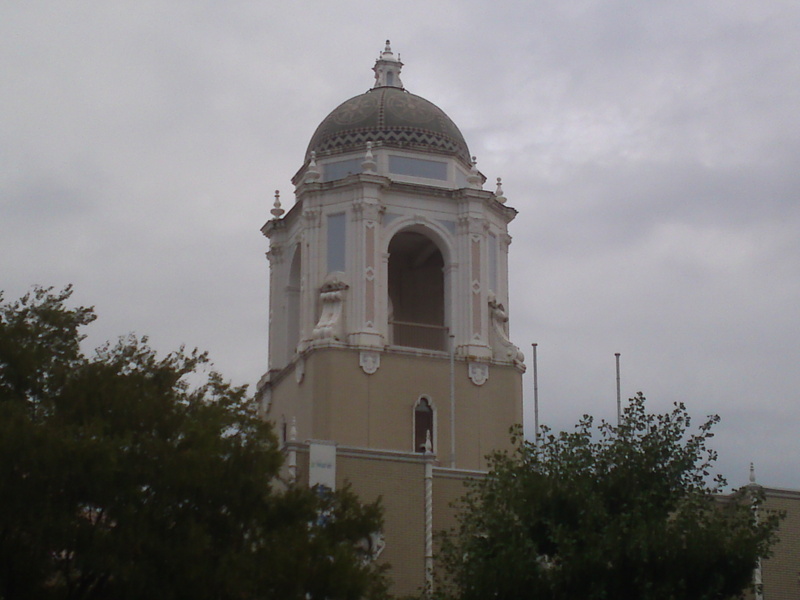 44) Former Shizuoka City Hall Dome in Shizuoka City! 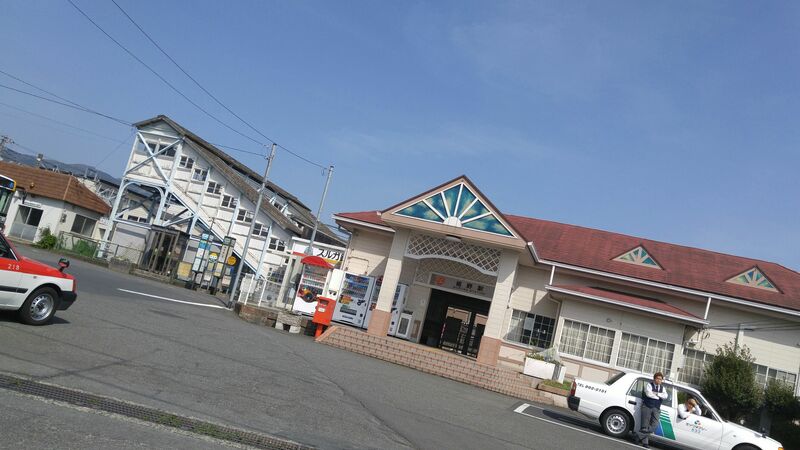 The former City Hall of Shizuoka City was built in 1934　although the City of Shizuoka got its present name and status in 1868 succeeding to the City called Sumpu when Tokugawa Ieaysu retired from politics to settle in Fuchu. 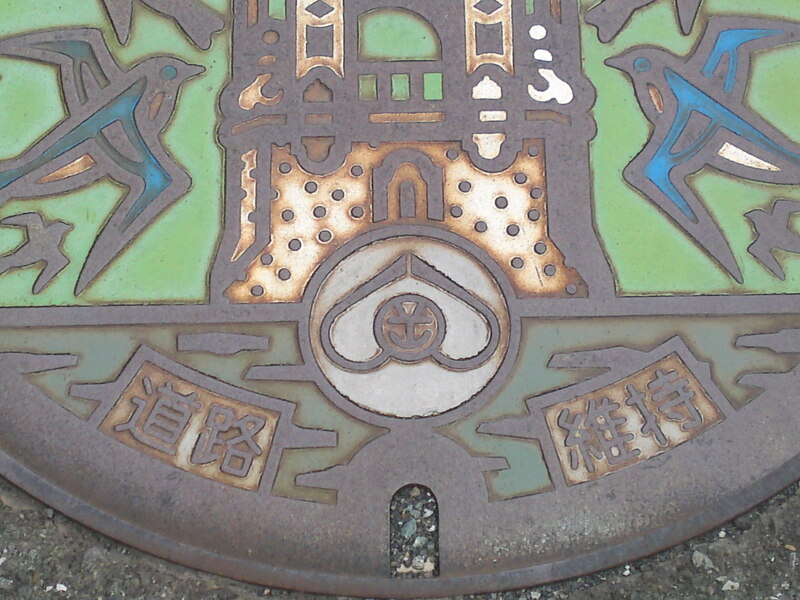 In 1996, when the new Shizuoka City Hall had been completed, the Shzuoka City Mayor of the time, Shingo Amano, ordered the former building to be pulled down but fortunately a petition from the citizens of Shizuoka prevented him to do so and the building the same year became an intangible Shizuoka City Culture Asset thus preventing anyone to change it. 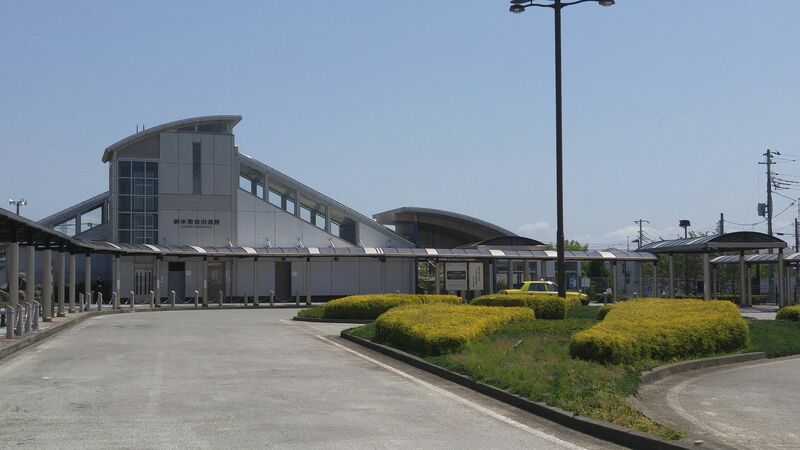 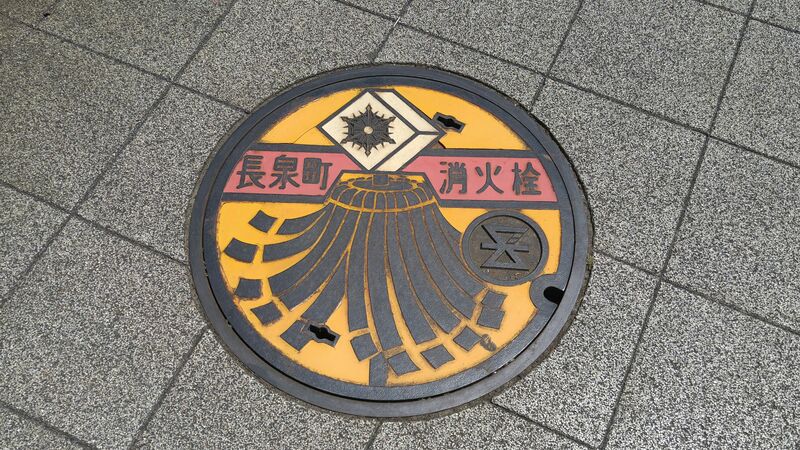 It subsequently became the hoe of the Shizuoka City Council among others. 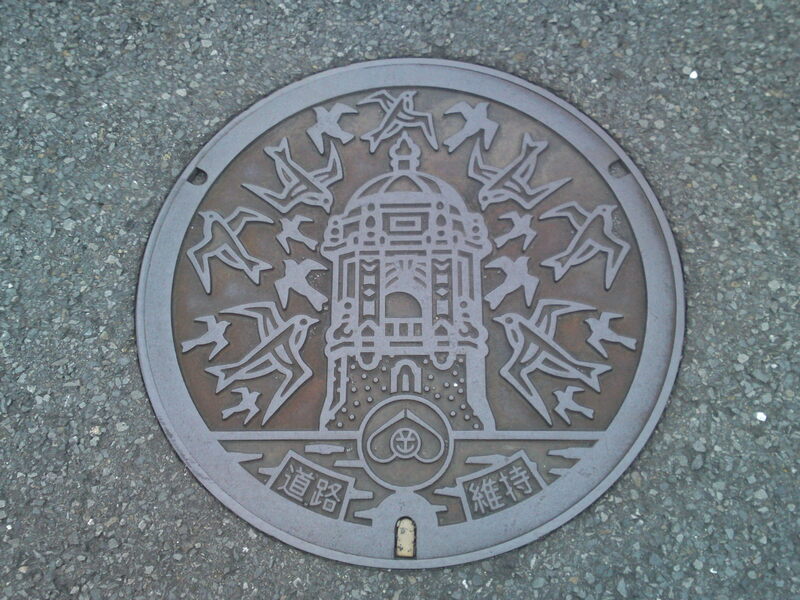 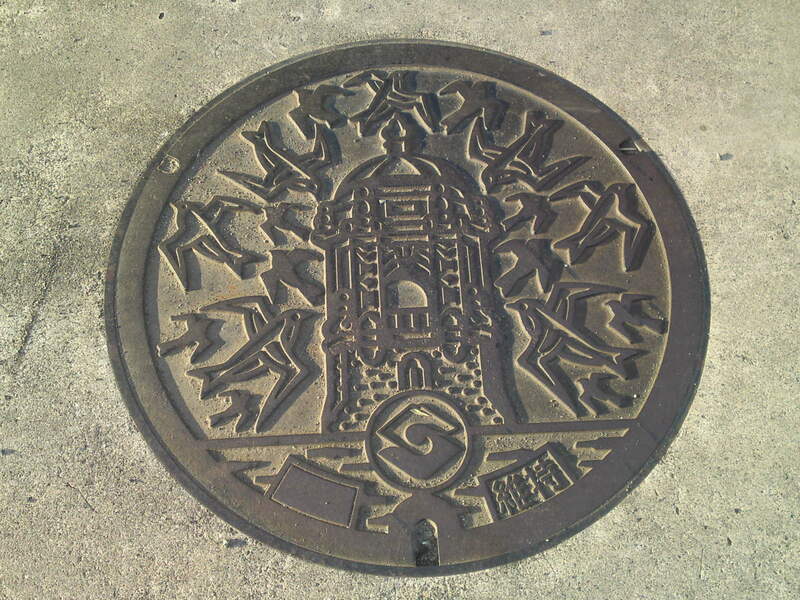 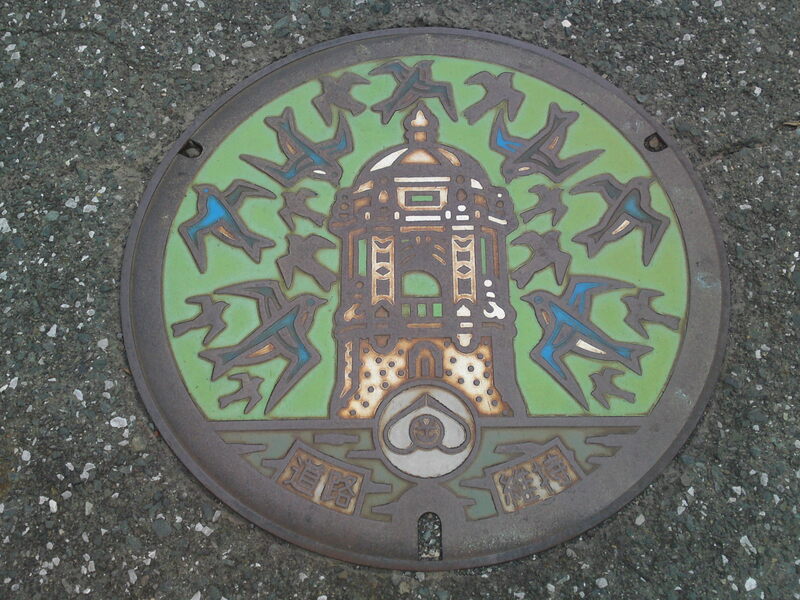 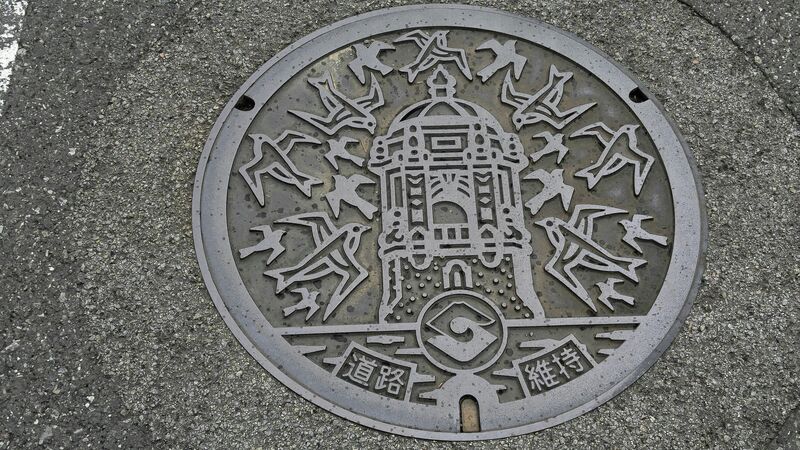 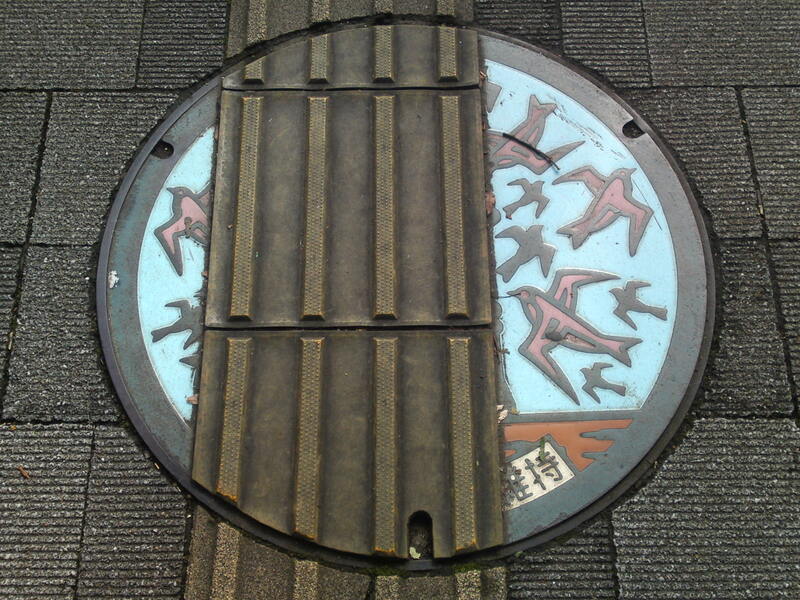 Probably the same year the first manhole cover representing the former City Hall surrounded by swallows, the official birds of Shizuoka City at the time appeared on the streets of Shizuoka City. 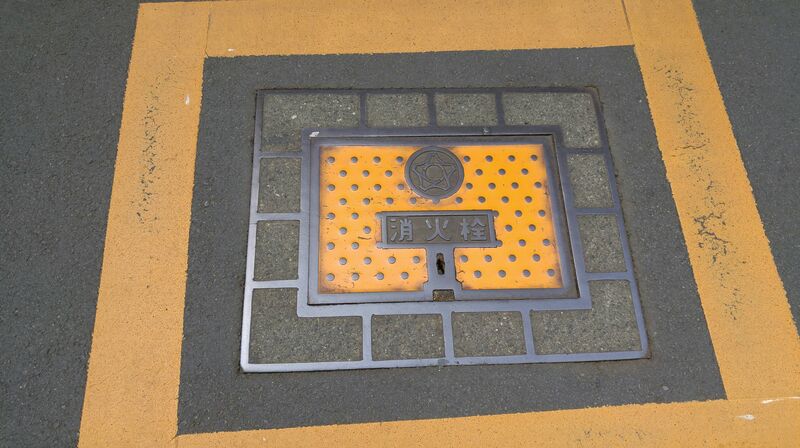 Although the City Hall is located north of Shizuoka JR Station , most former city hall designed manhole covers are found south of Shizuoka JR Station! 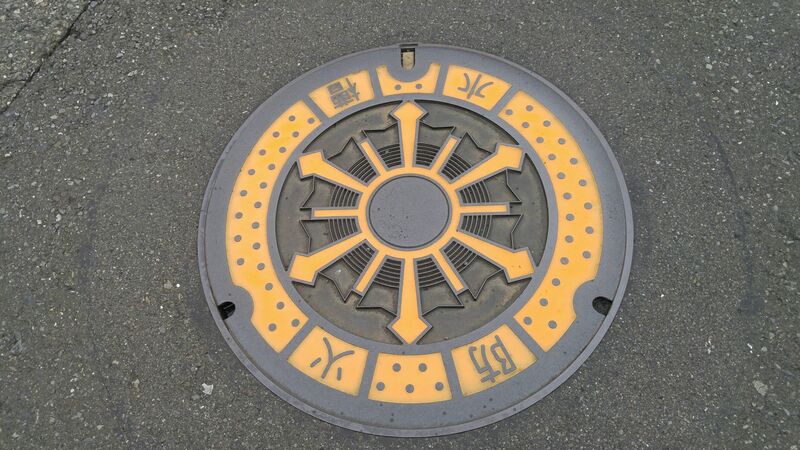 These manhole covers are found over accesses to road maintenance subterranean networks. 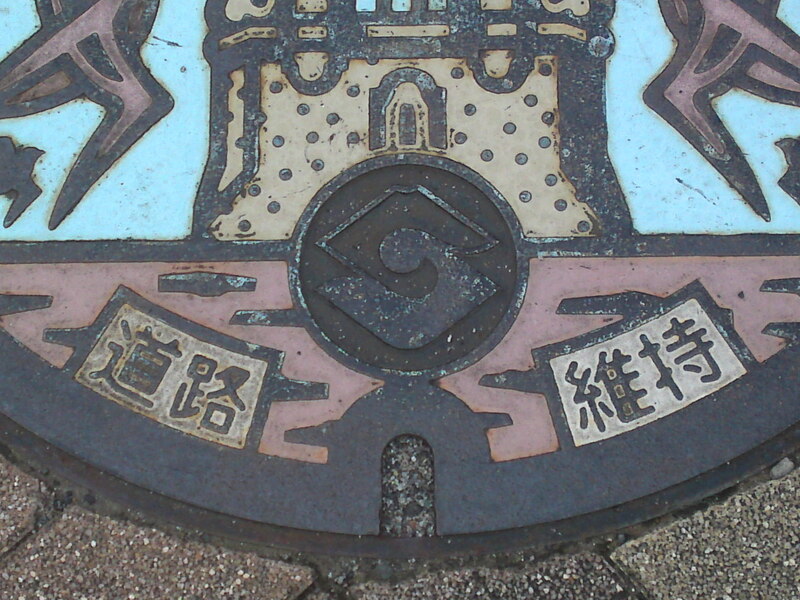 The Shizuoka City logo is the old one with the kanji character for “city”. 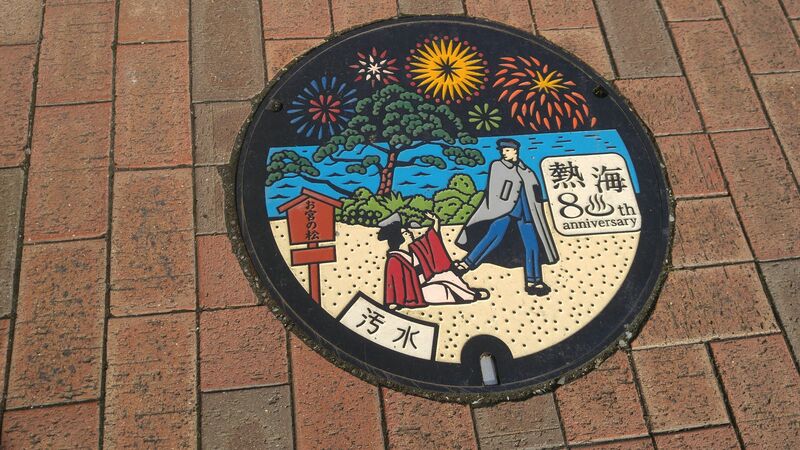 The colored manhole cover is unique and can be found only at the bottom of the steps leadin to Toshogun Shrine in Kunozan, Suruga Ku, Shizuoka City. 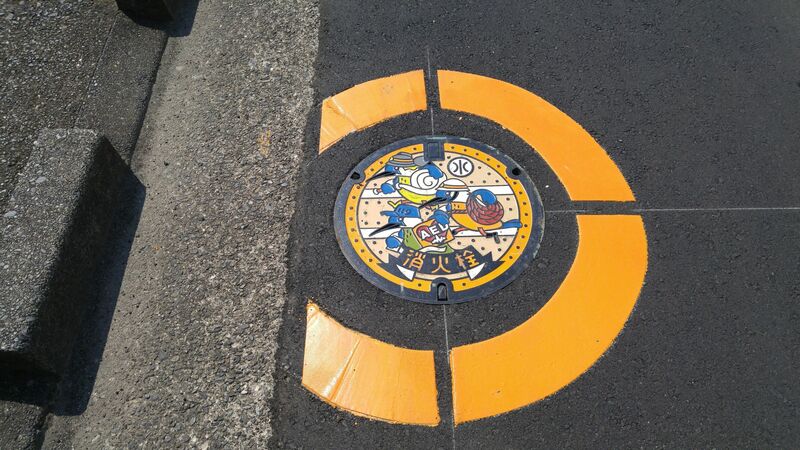 Most neutral versions are to be found along the main road going south from Shizuoka JR Station south exit and near Shizuoka University! 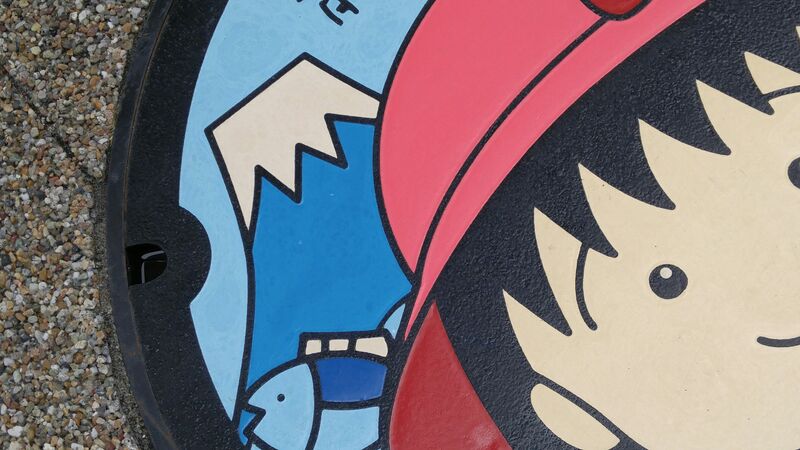 Check the logo if you find one! 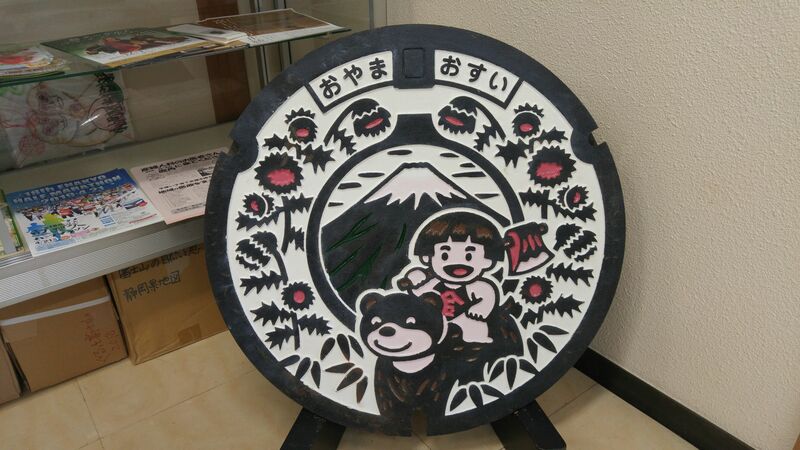 There is also a unique one, not in neutral metal, but varnished in black in front of the former Shizuoka Prefecture Hall across the the Shizuoka City Hall! 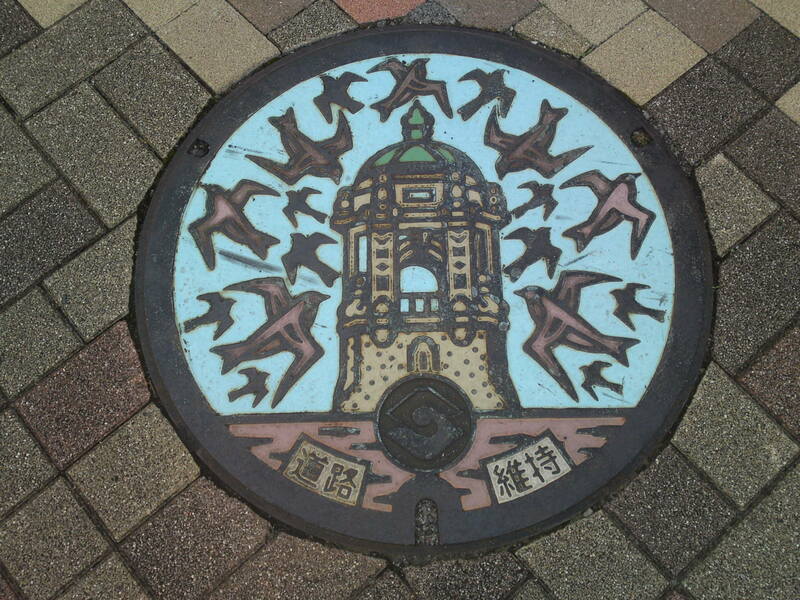 In 2003, with the advent of Shimizu City being merged to Shizuoka City, a new type was created with a blue instead green background and pink instead of blue swallows! 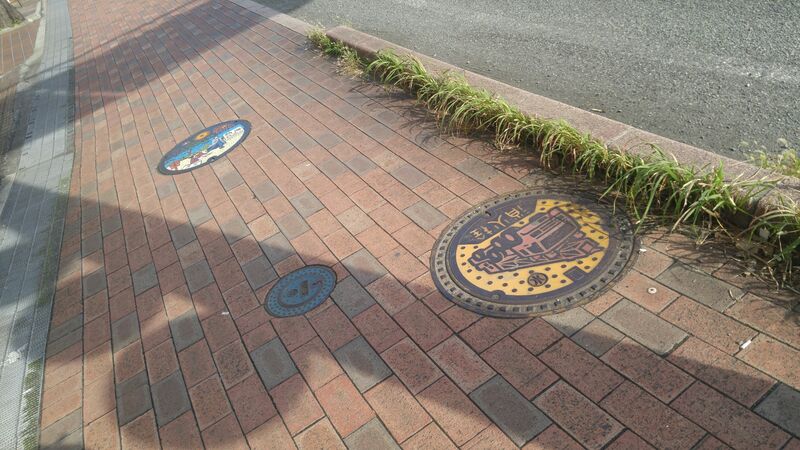 The one above can be found on the pavement not far from Apita Store in Suruga Ku, Shizuoka City! 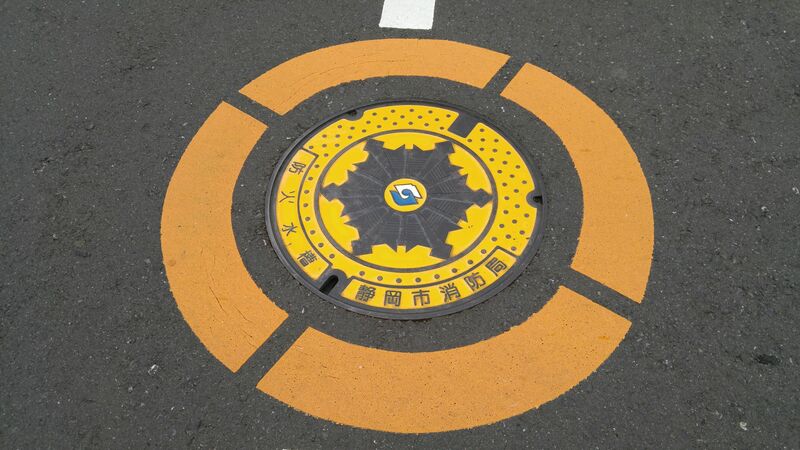 The logo of Shizuoka City was hence changed to a double geometric design! 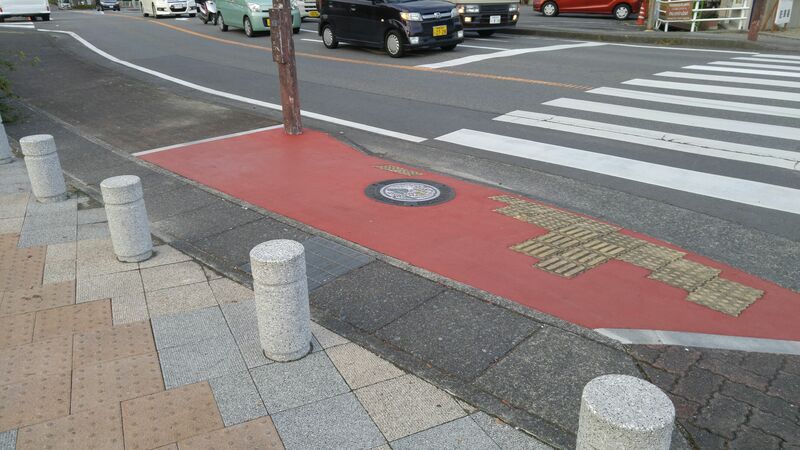 There are only two samples of the colored version, the second one in front of the former Shizuoka Prefecture being unfortunately partly covered! 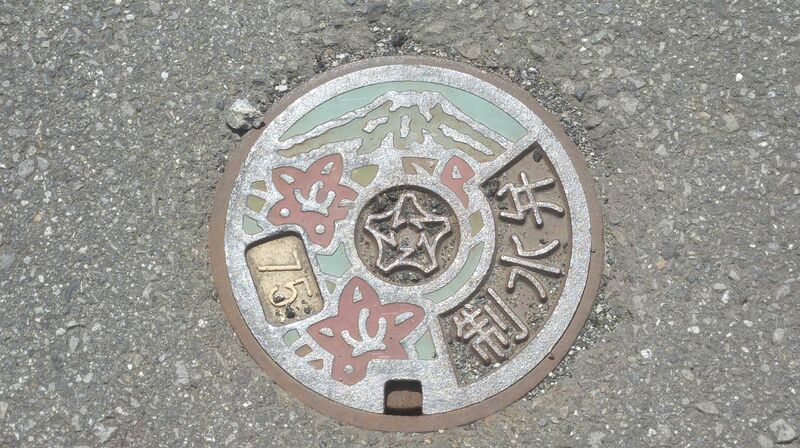 Strangely enough the modern version is very rare, as I found only three along the road between Ikeda Primary School and Honkaku Temple in Ikeda, Suruga Ku, Shizuoka City! 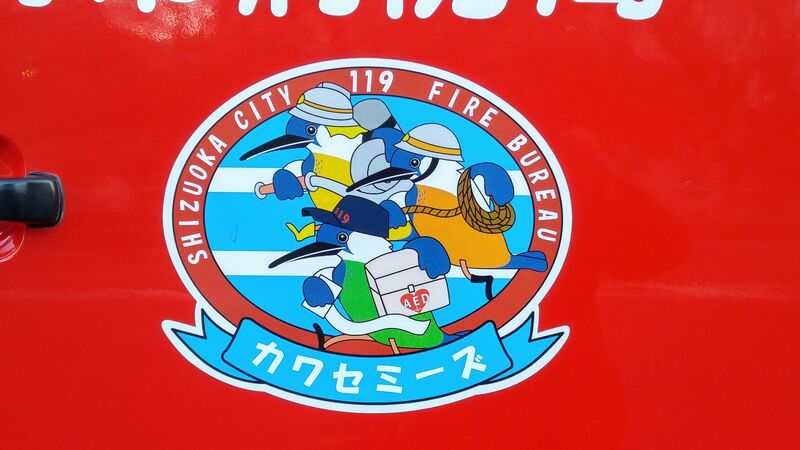 Check the new Shizuoka City logo! 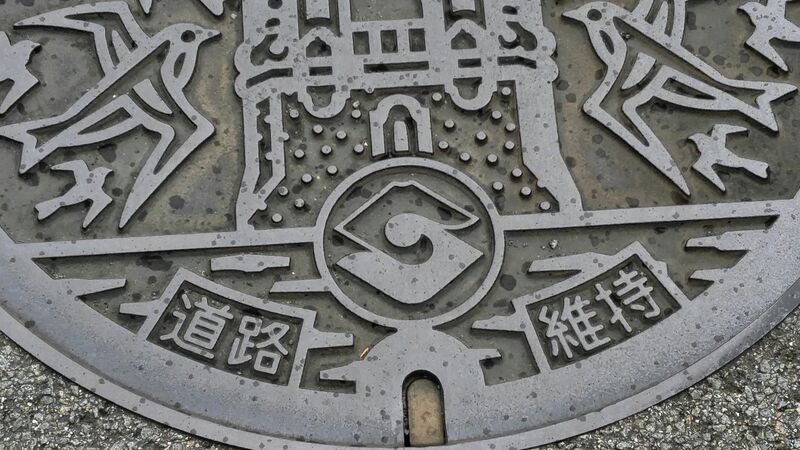 There is actually a unique sub-type located in Okitsu, Shimizu Ku, Shizuoka City! 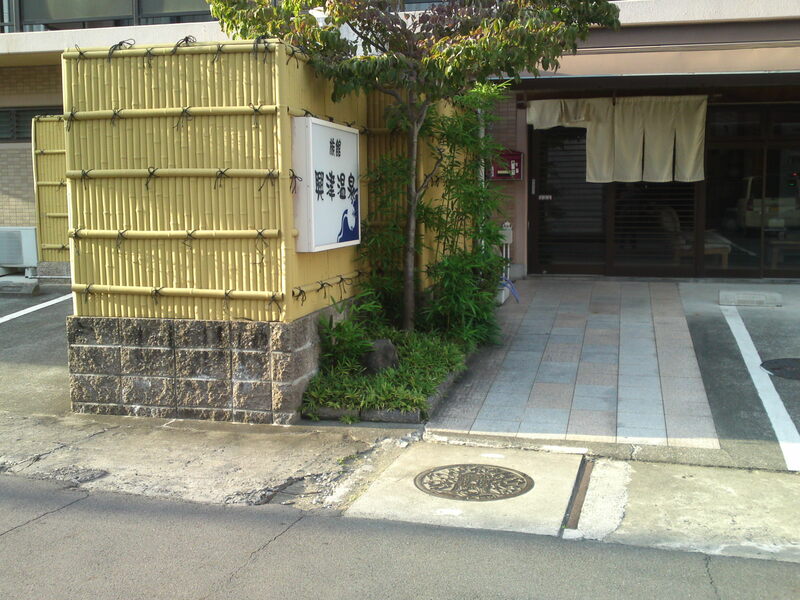 It is located in front of Okitsu Hot Spring Building in Okitsu! 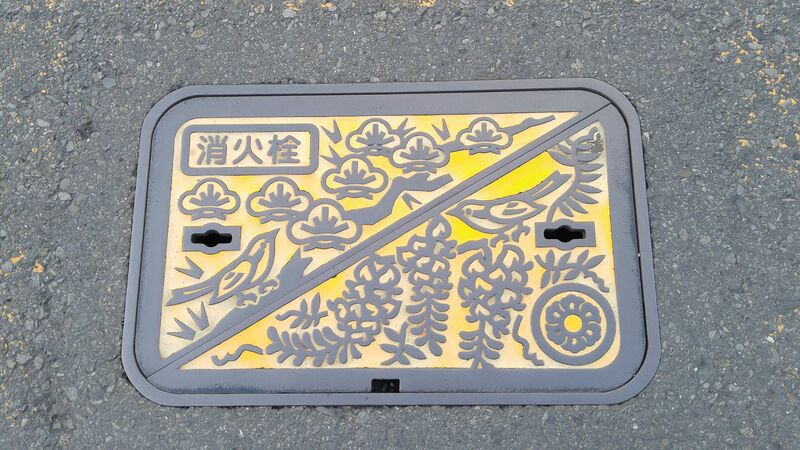 The two kanji representing “Roads” at the bottom right had been suppressed! 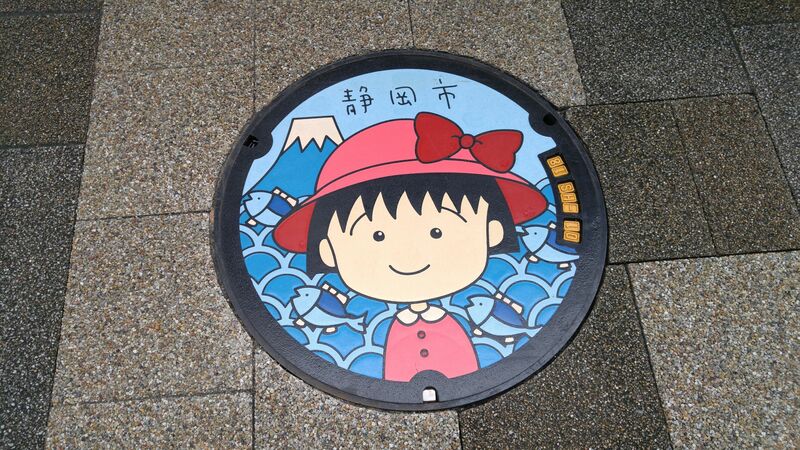 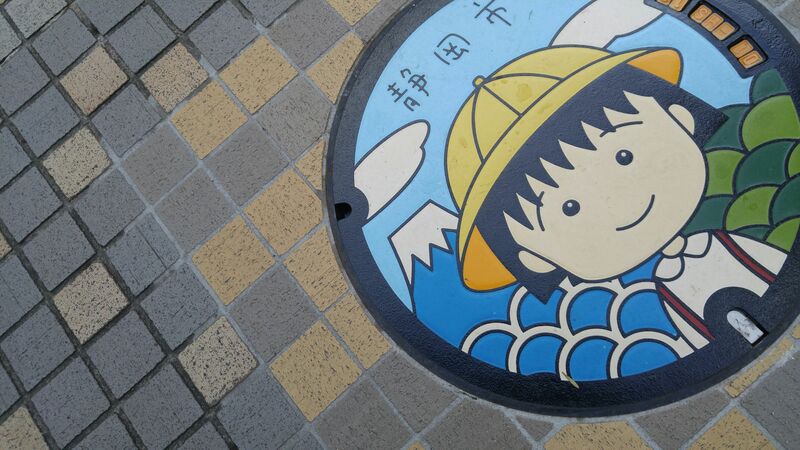 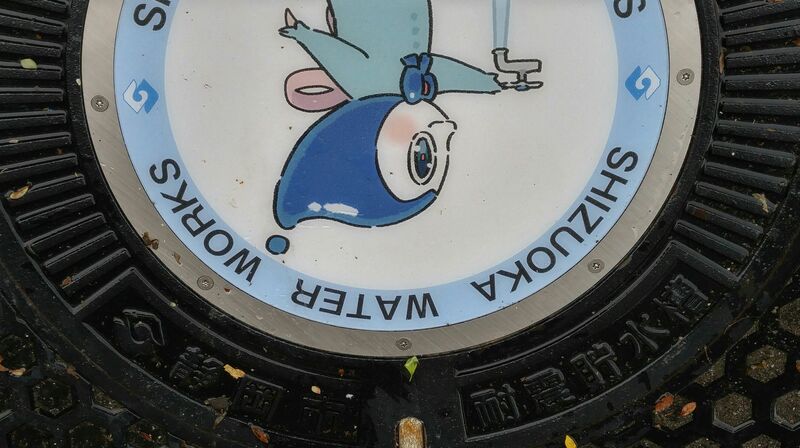 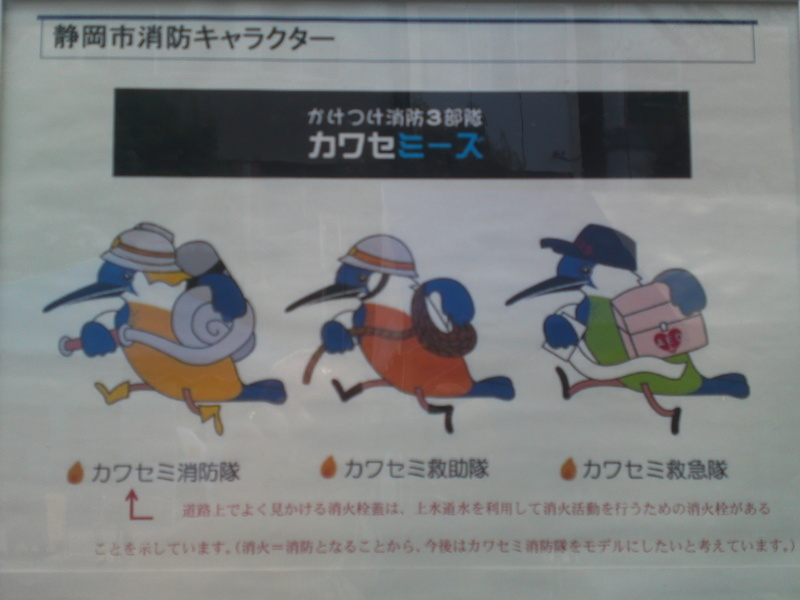 43: New Shizuoka Water Works Character Manhole Covers in Shizuoka City! 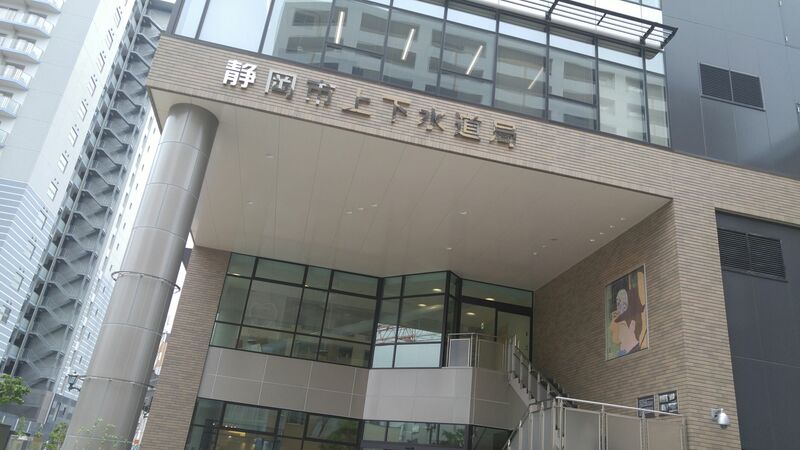 The other day, for totally unrelated reasons, I happened to walk past the Shizuoka Water Works Building which also houses the Suzuki Culinary Institute. 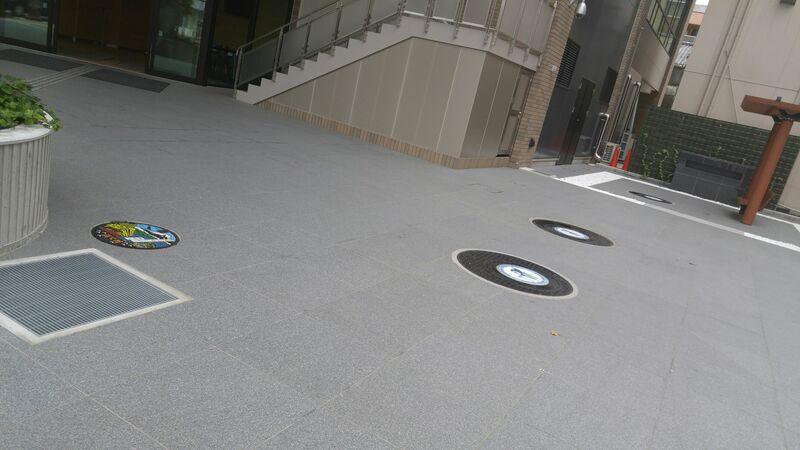 The whole street, which used to feature most movie theaters before they were moved to Cenova Dapartment Store, has been renovated by the City as it is being developed into a new residential district. 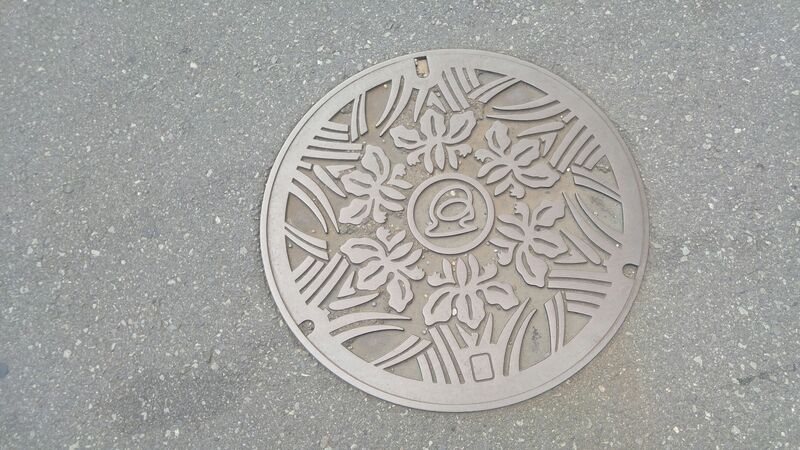 Accordingly many manhole covers of all sizes and designs have been replaced with new ones! 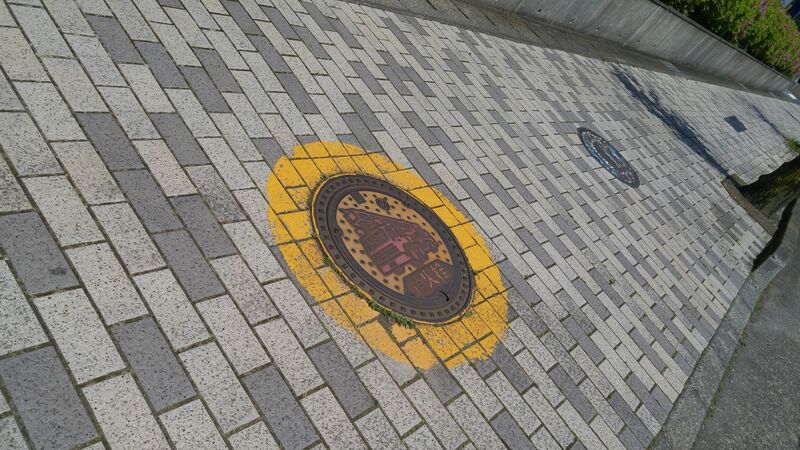 The whole pavement had completely been relaid in front of the building but it was definitely unusual! 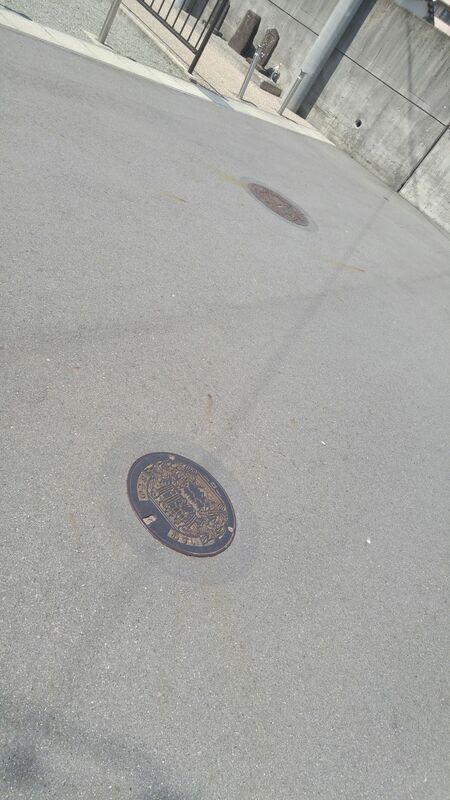 A water valve access with the Sumpu Castle. 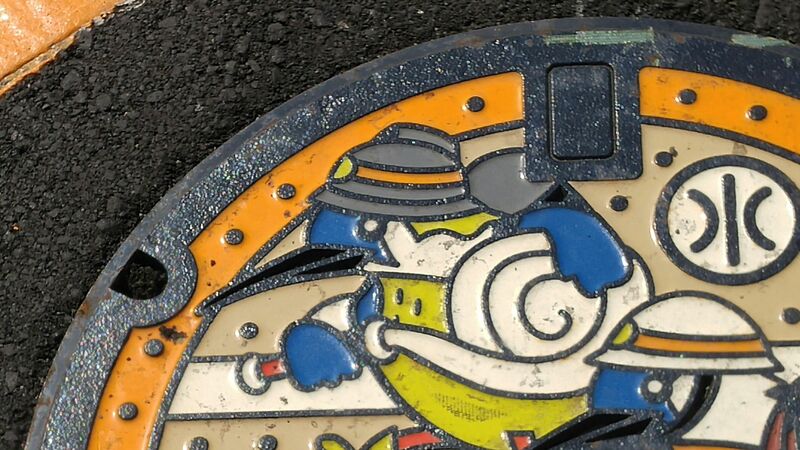 new, but noting unusual! 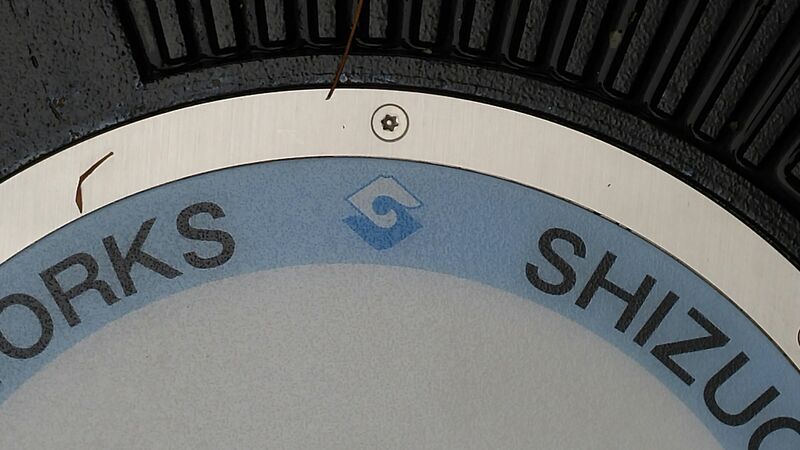 A brand new standard sized air-pressured water valve of a usual dseign! 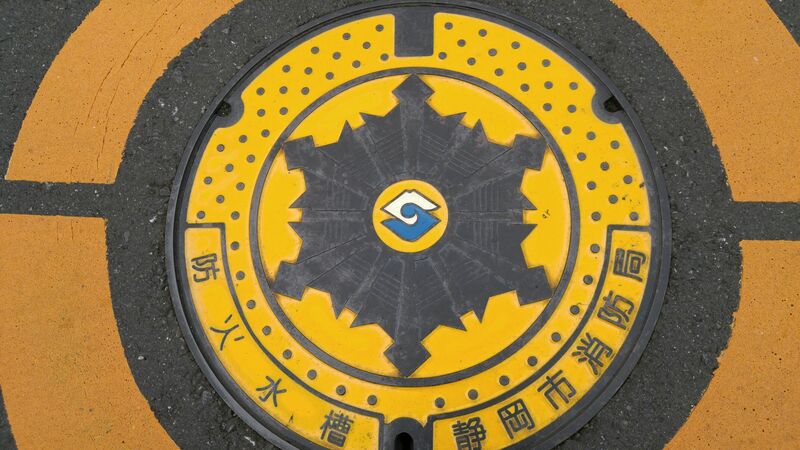 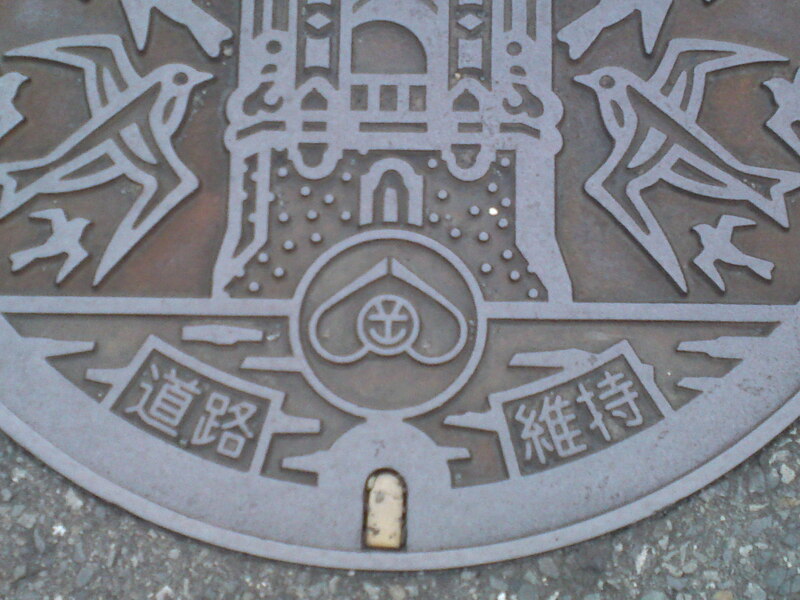 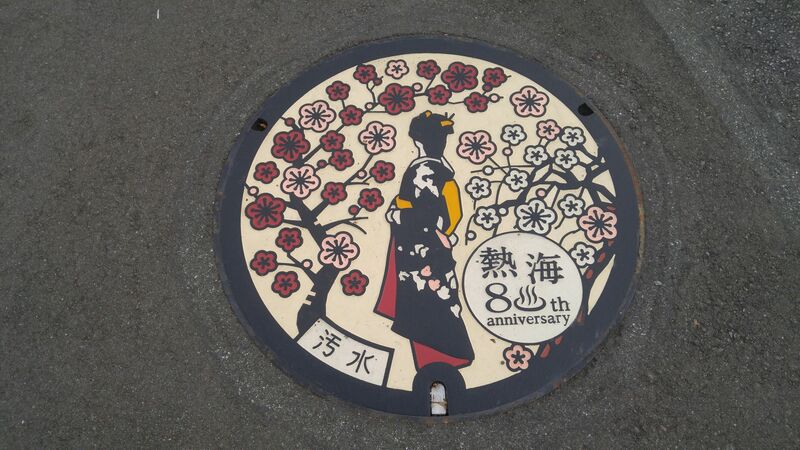 The new (and third type) Tokugawa Ieyasu In Shizuoka City fire hydrant manhole cover. 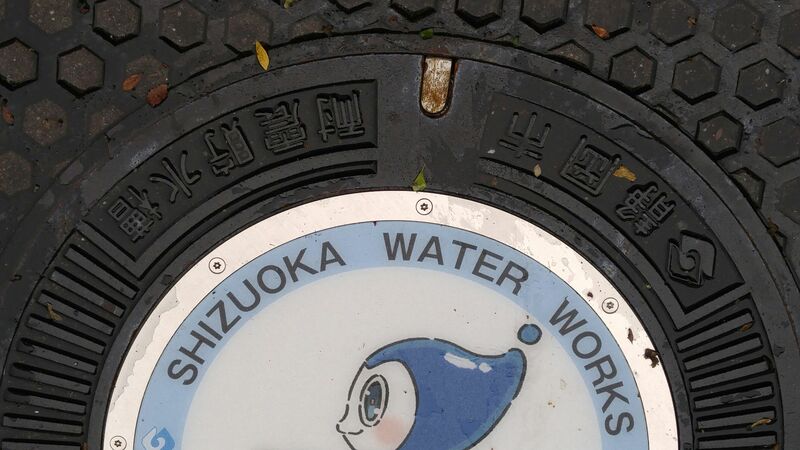 I thought it had been first laid in April this year but I might have to investigate as the Shizuoka Water Works Building was inaugurated in February! 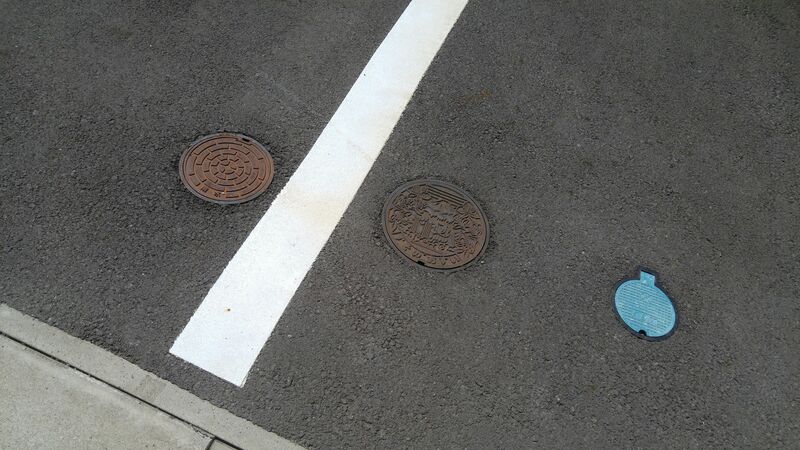 Now, there are only three of them with a different each! 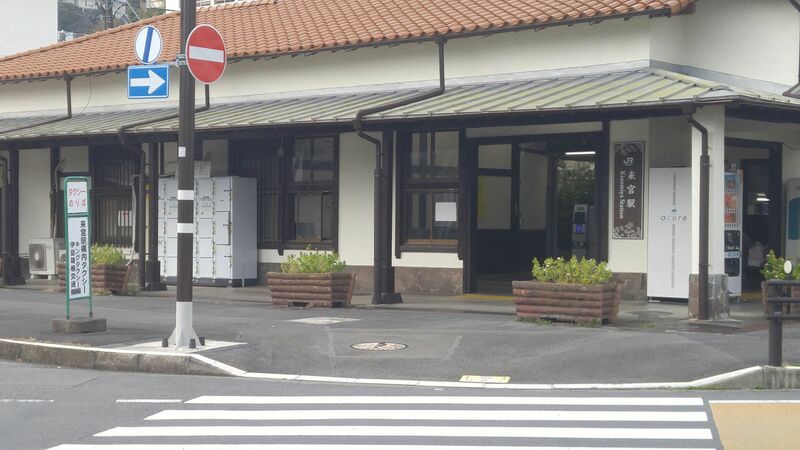 I actually paid a visit and embarrassed quite a few officials who nonetheless graciously answered this strange expat’s questions that no Japanese would dare to! 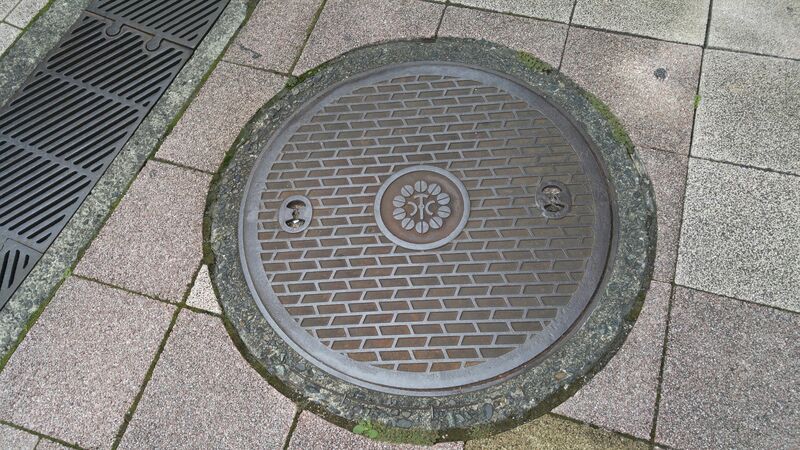 These manhole covers, (actually double), are only partly cast with a round metal cover screwed on the wrought iron base. 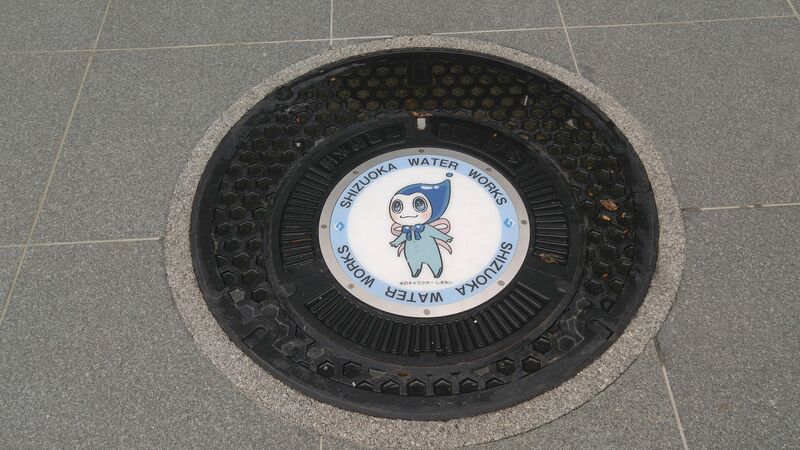 The character is actually a raindrop! 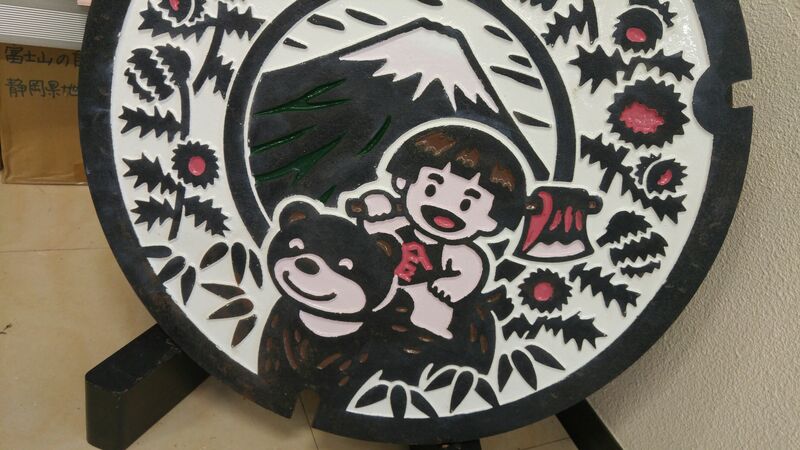 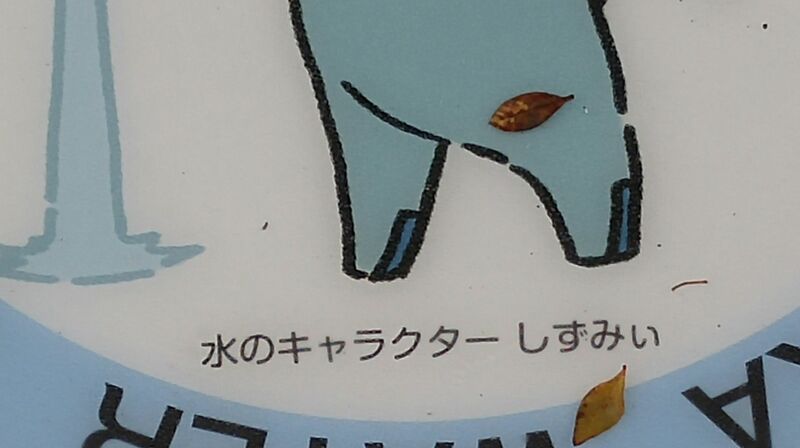 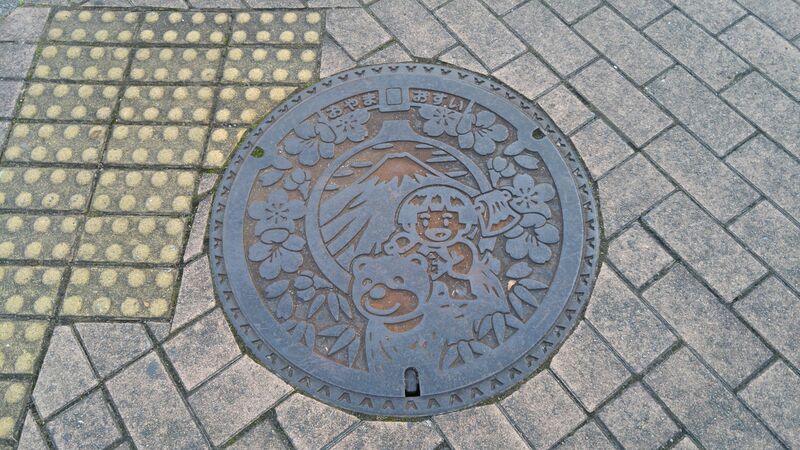 It also bears the Shizuoka City logo! 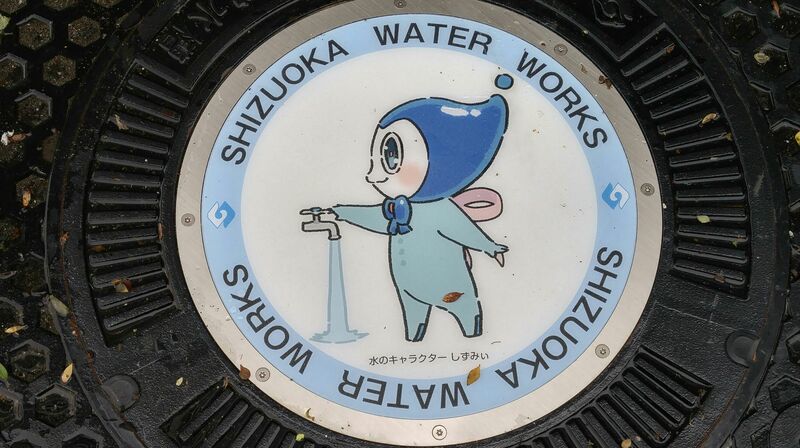 “Shizuoka Water Works” in English! 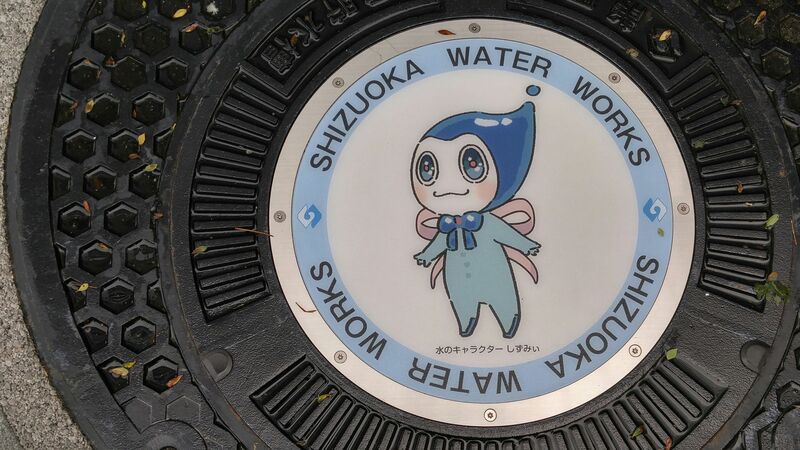 And the water character even has a name! 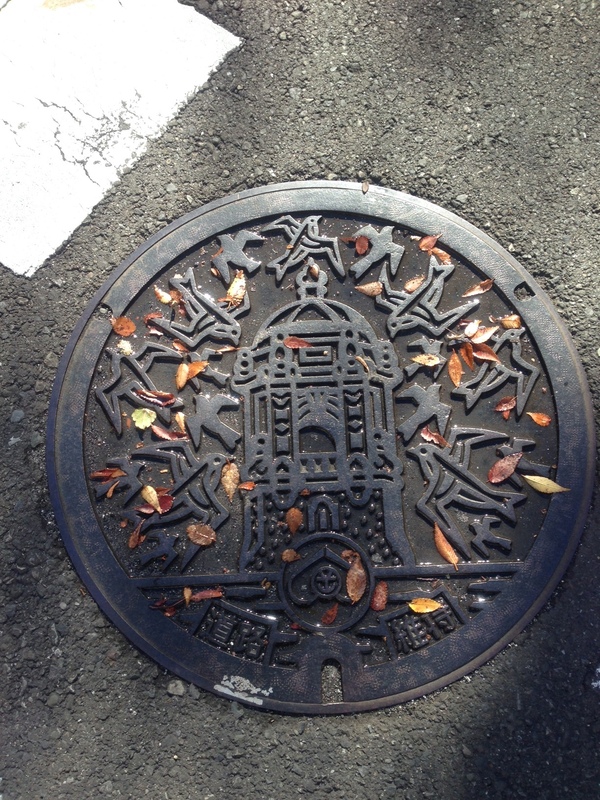 しずみい/”Shizumii”! 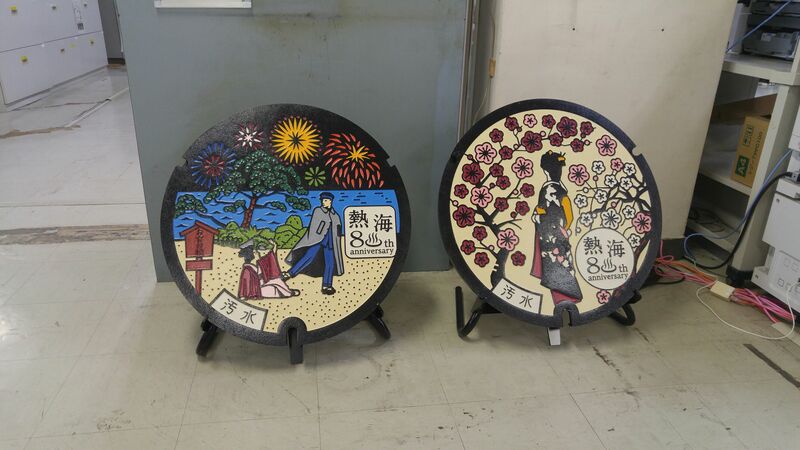 All three are markes: “Shizuoka City Earthquake-resistant Water Tank”! 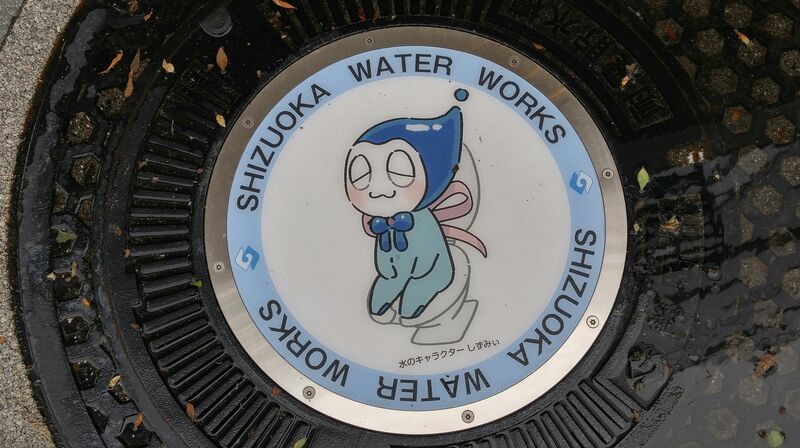 The main use for water in Japan! 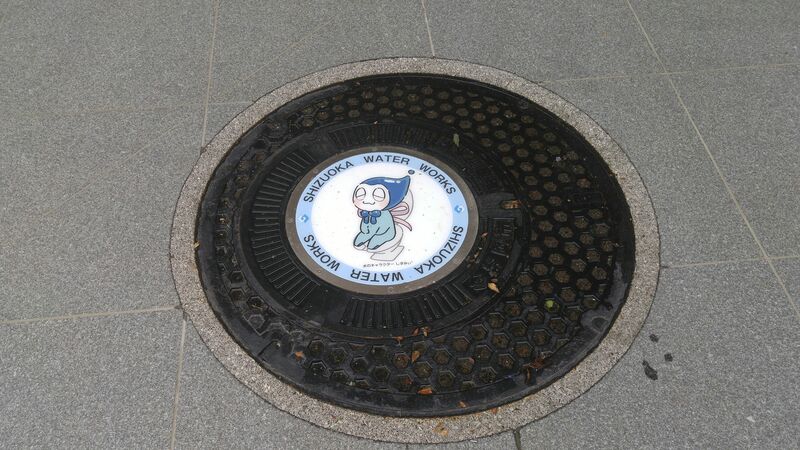 The importance of saving water! 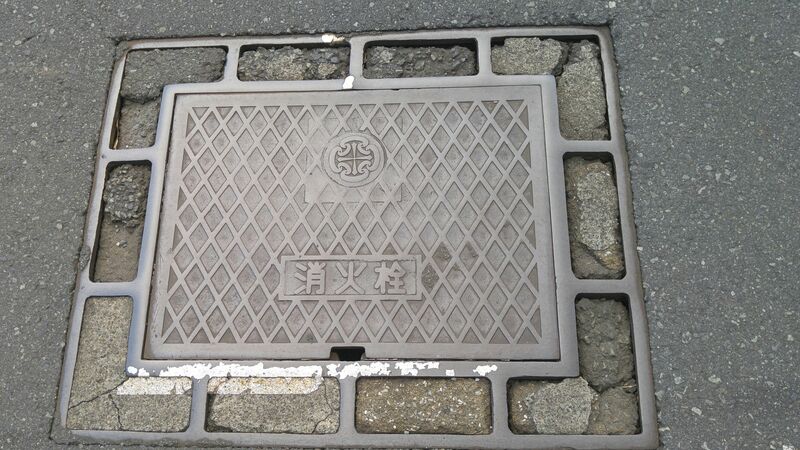 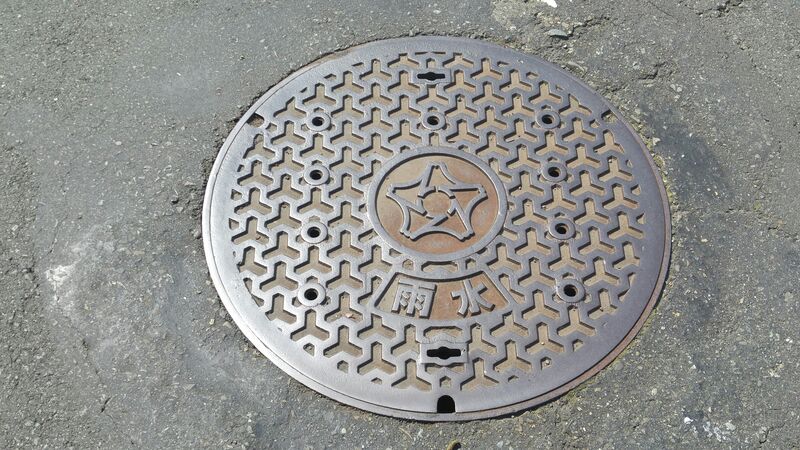 The officials told me there no other new manhole covers planned for the near future in shizuoka City, but since they take care only of water I wouldn’t bet on the impossibility of new discoveries soon! 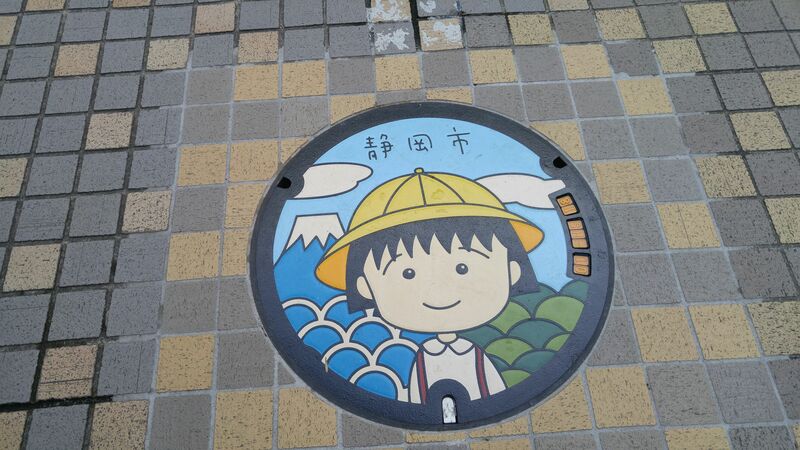 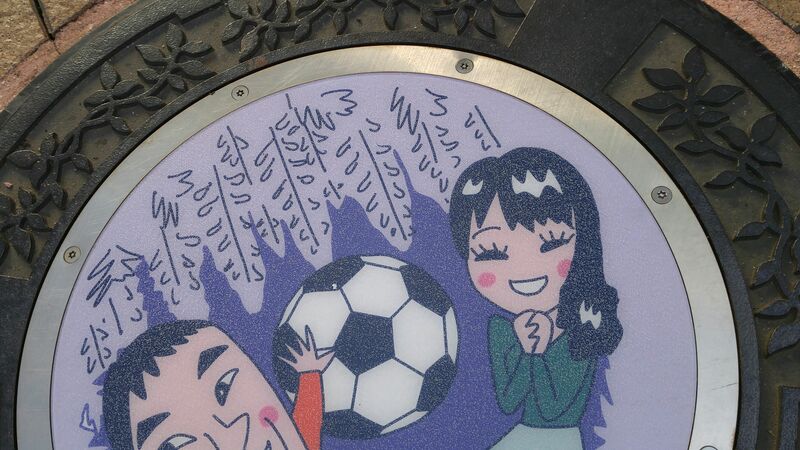 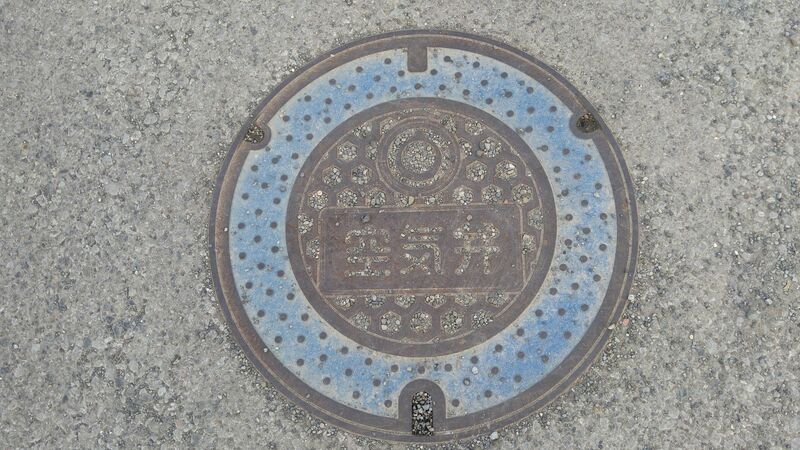 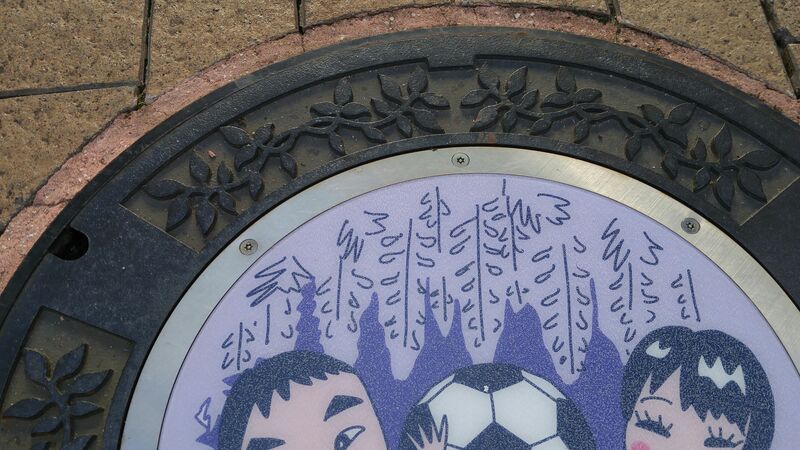 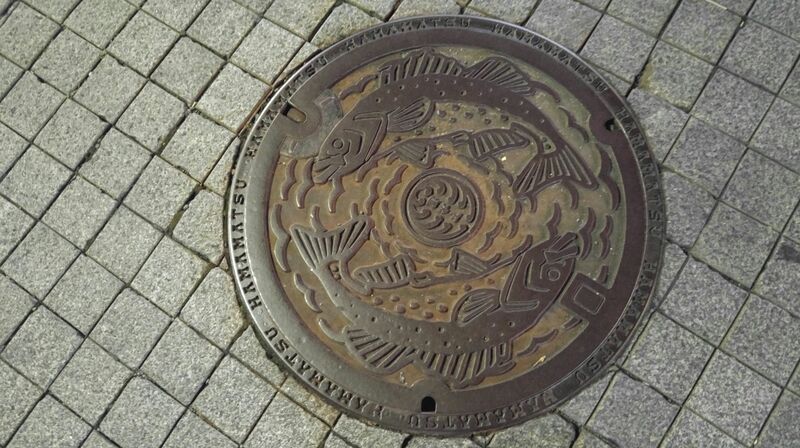 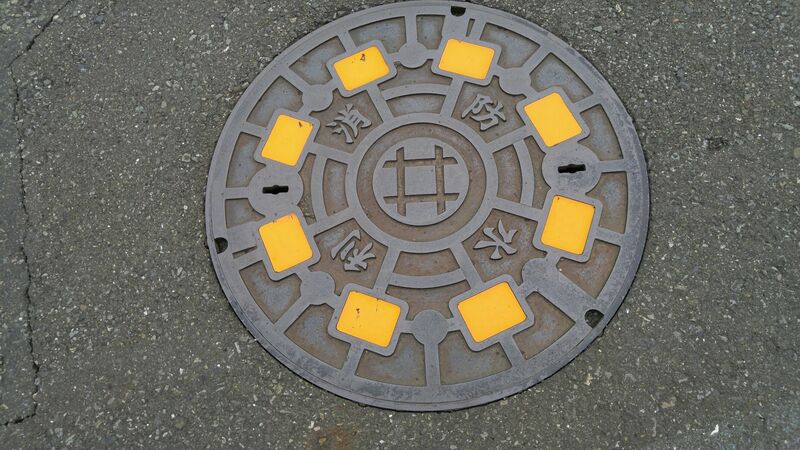 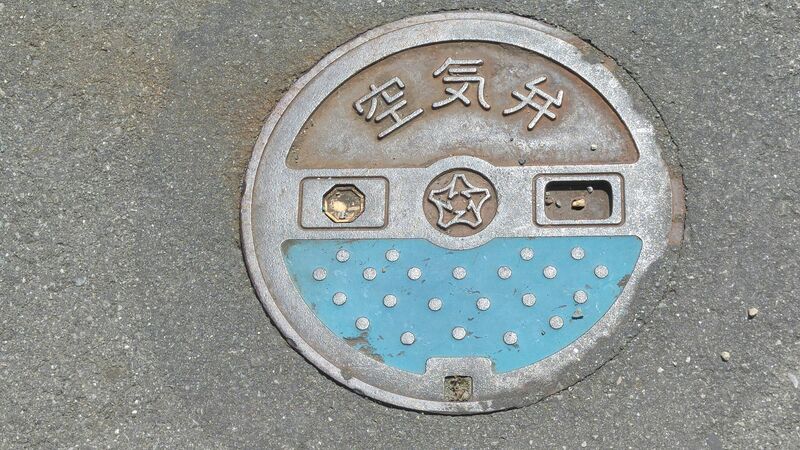 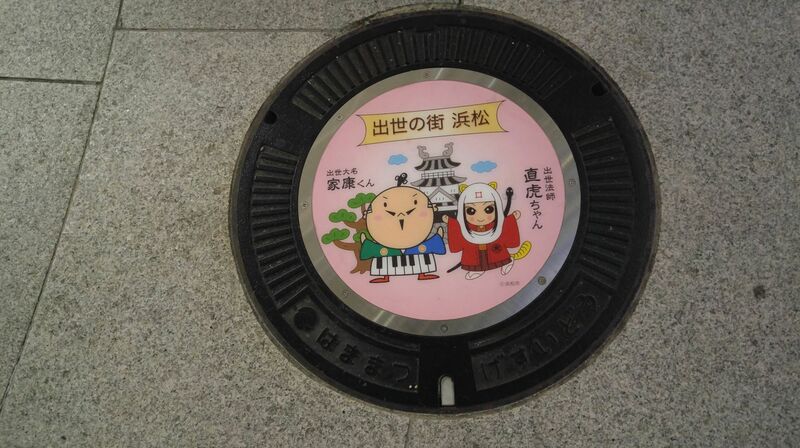 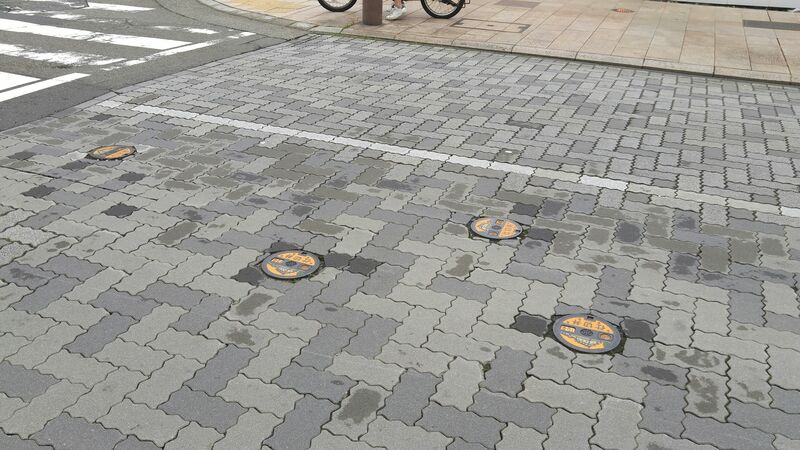 42) Manhole Covers in Susuno City! 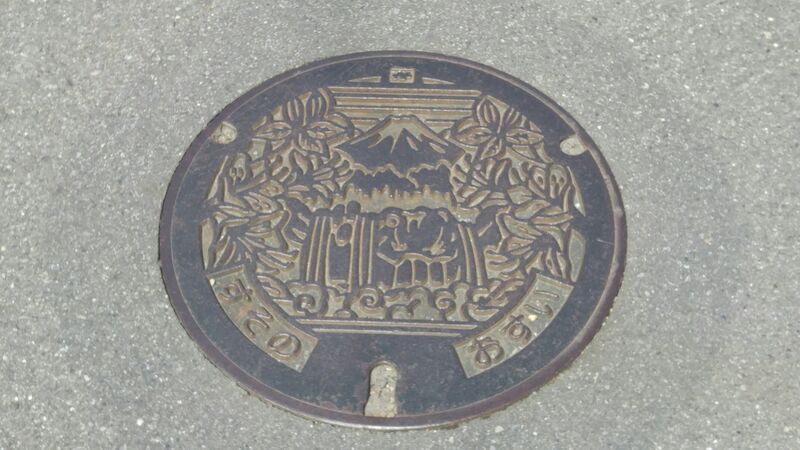 The other day, my visit to Nagaizumi Cho proving shorter than expected I took the opportunity to continue my trip to Susono City in search of more manhole covers! 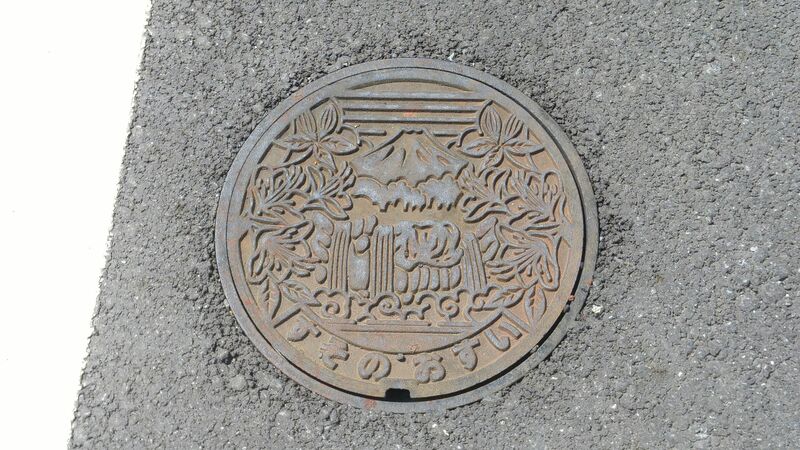 I was greeted at the exit with this fine but fairly common fire hydrant cover design with the difference that it bore the Susono City crest! This unusually decorated water valve cover can be found almost everywhere in town! 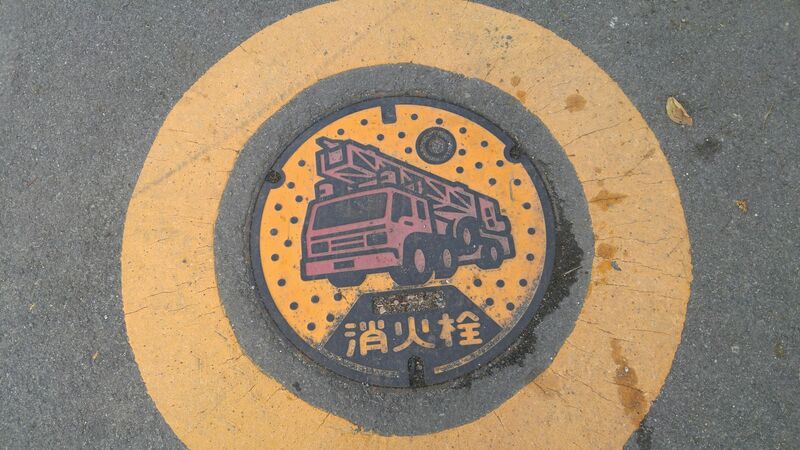 I soon found the standard sized neutral official Susno City manhole cover! 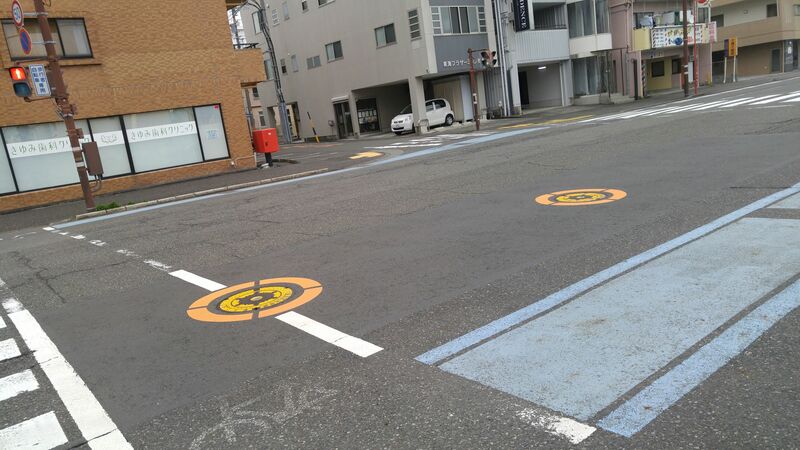 The same in medium size! 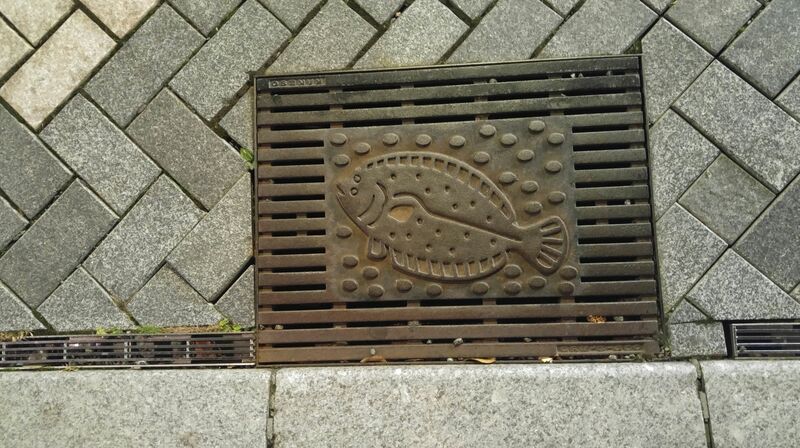 The same again in small size! 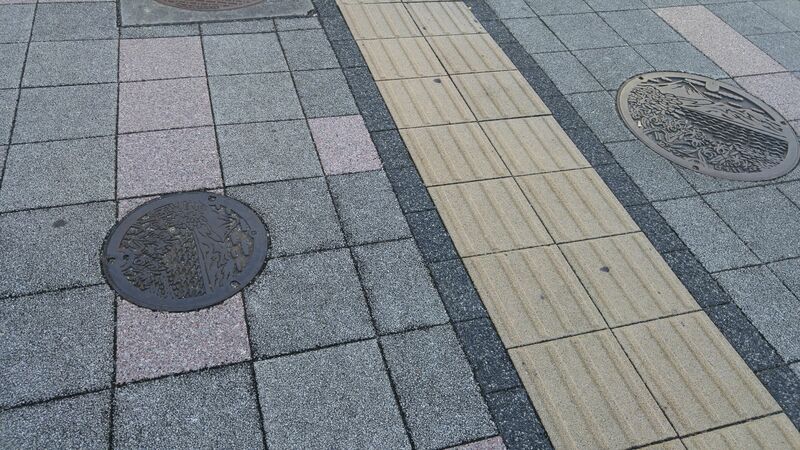 There were plenty of neutral covers near the Station but I didn’t seem able to discover the colored ones! 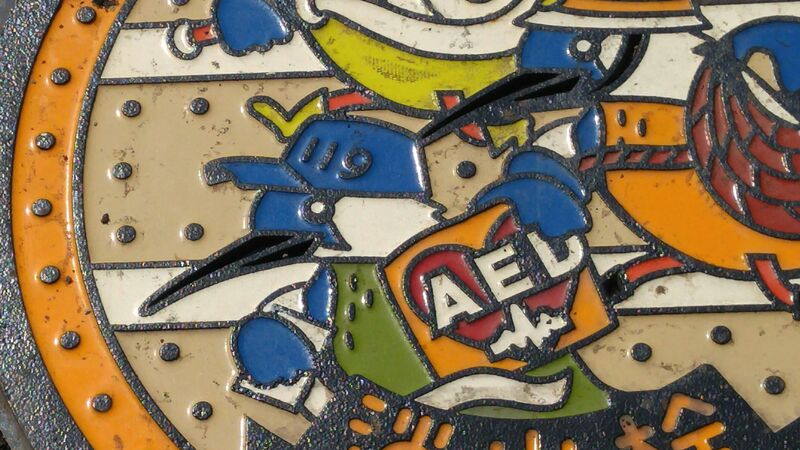 My eyes fell on this series of very small covers! 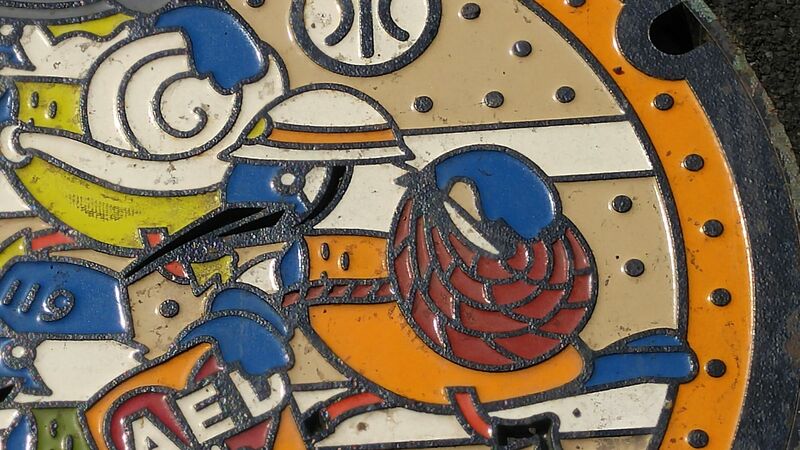 A neutral one, but even tinier! 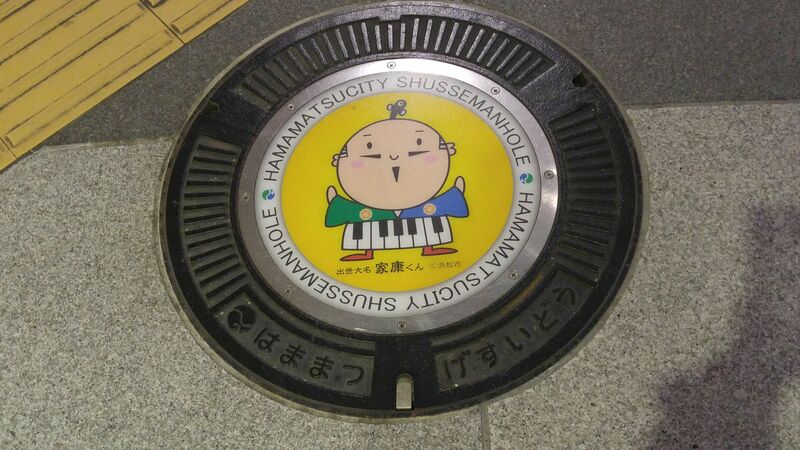 I decided to walk away from the station until I found the “main” street of Susono City! 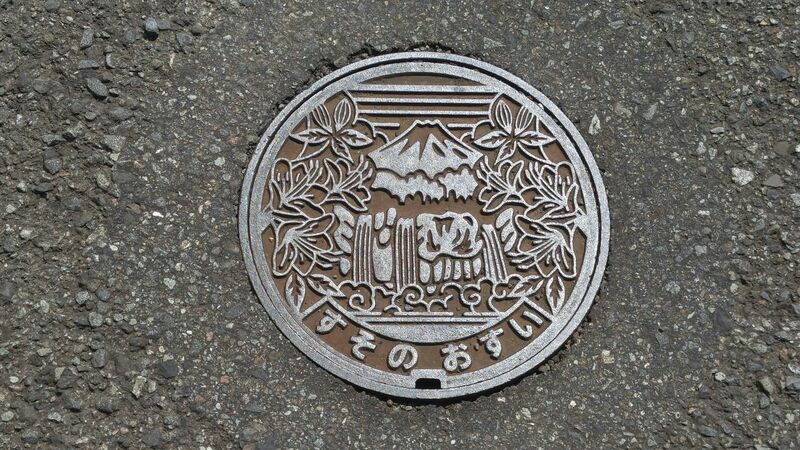 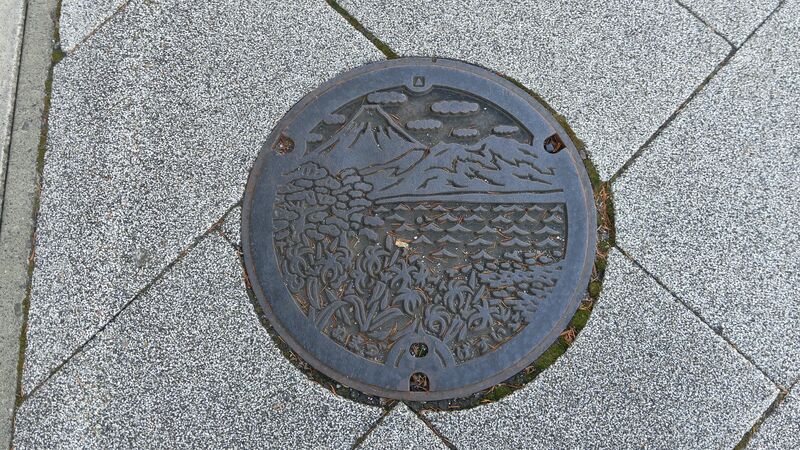 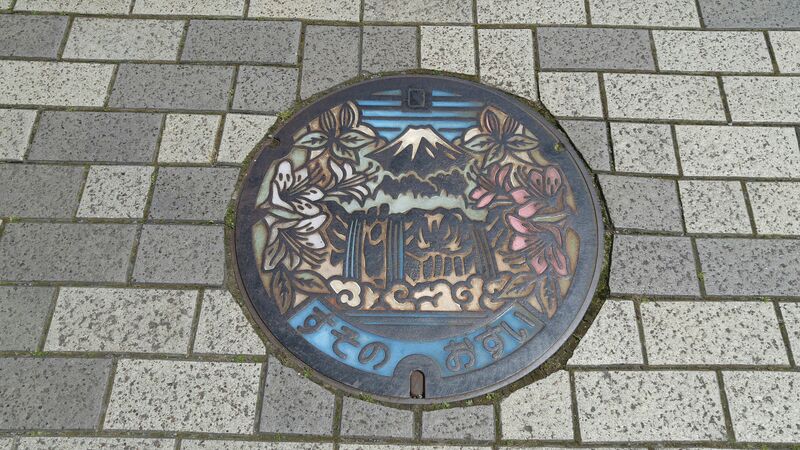 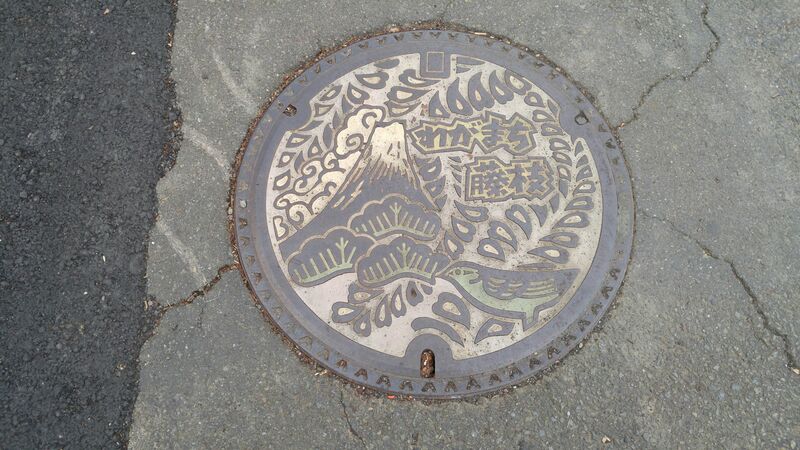 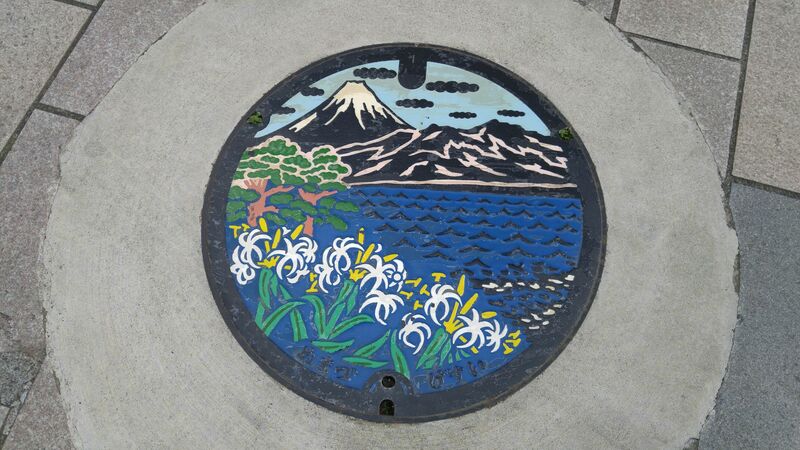 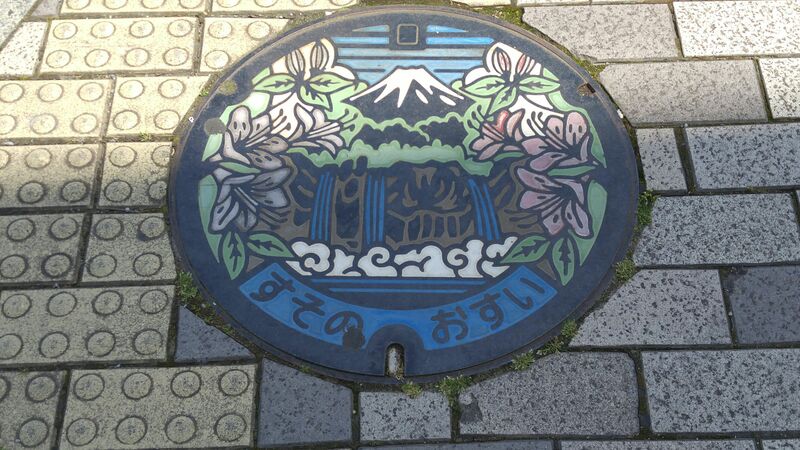 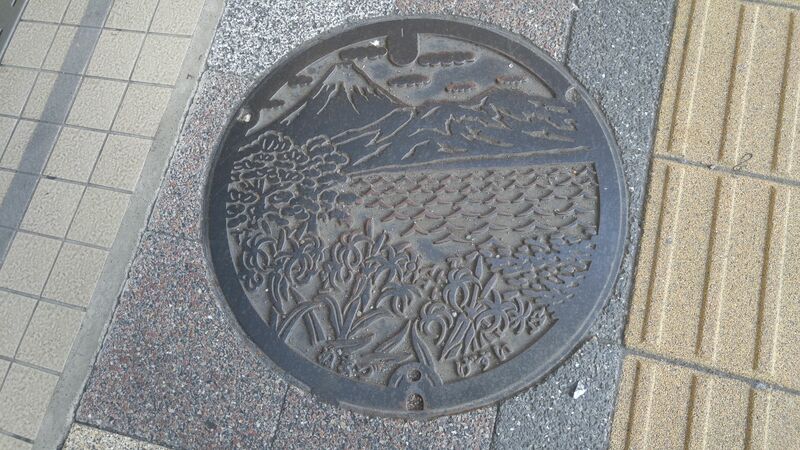 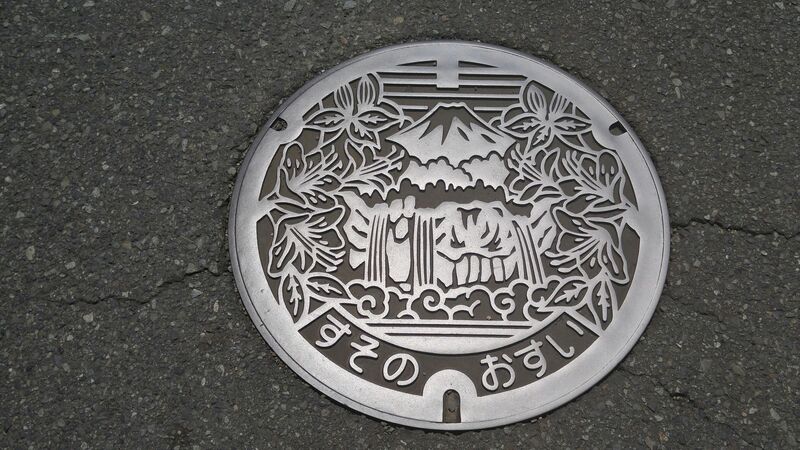 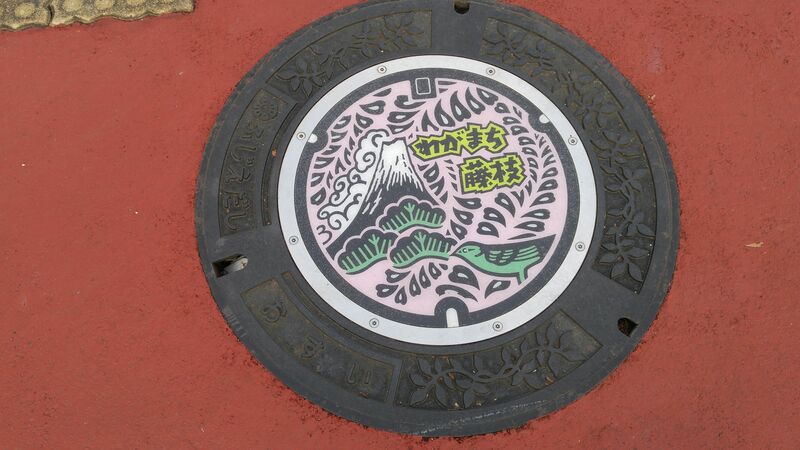 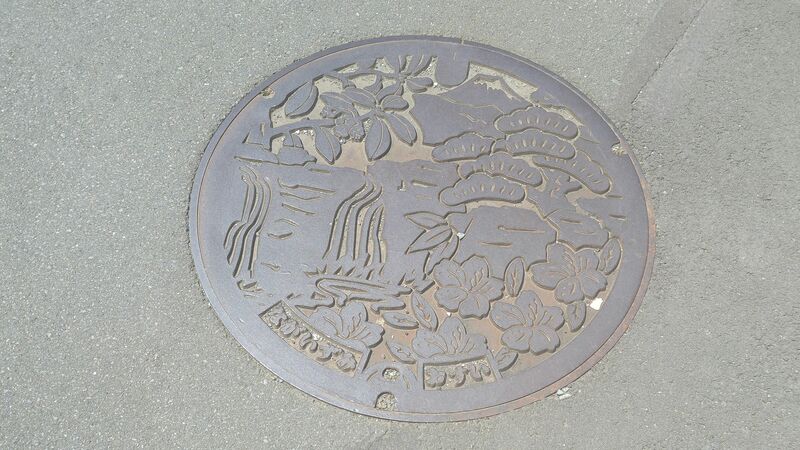 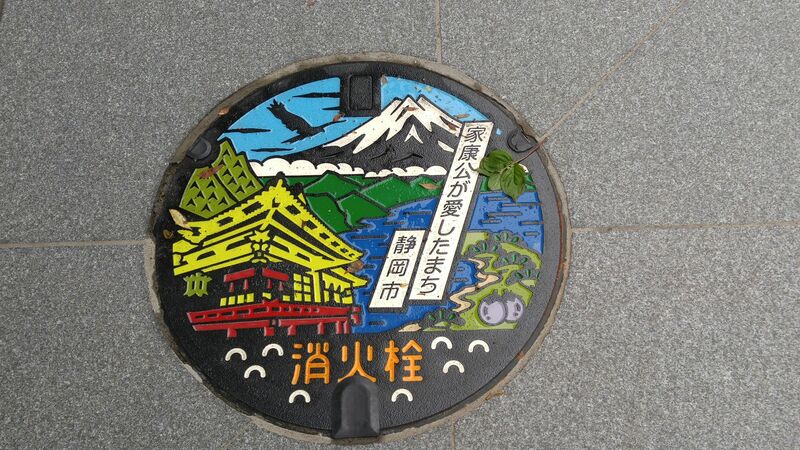 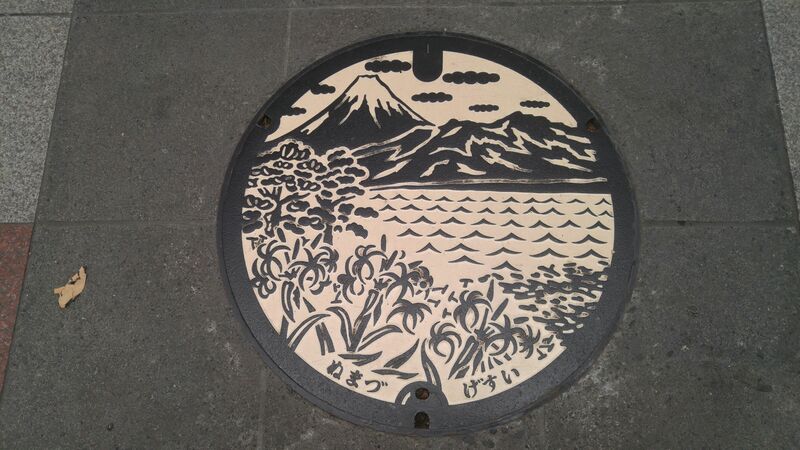 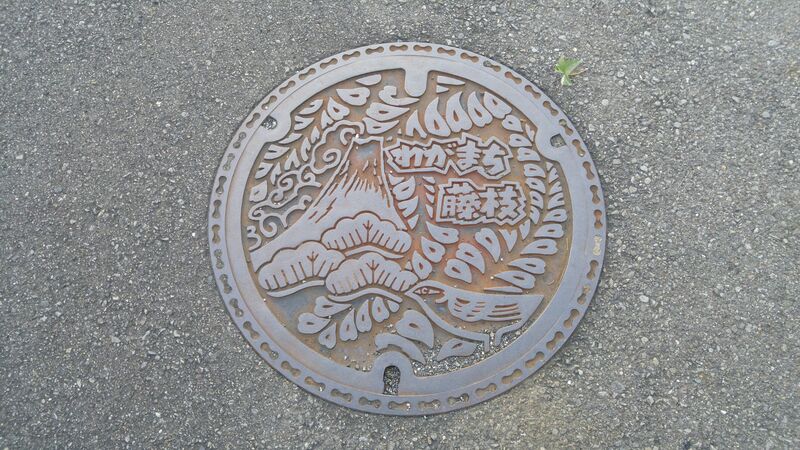 The official colored Susono City (sewers) manhole cover with Mount Fuji, the Five Dragons Waterfalls and Azaleas! 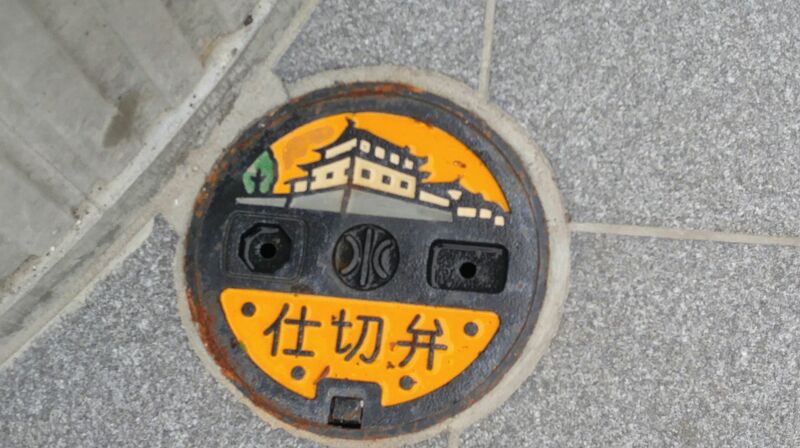 There are plenty of medium and small ones such as this medium-sized pressurized air valve with Susono City logo! 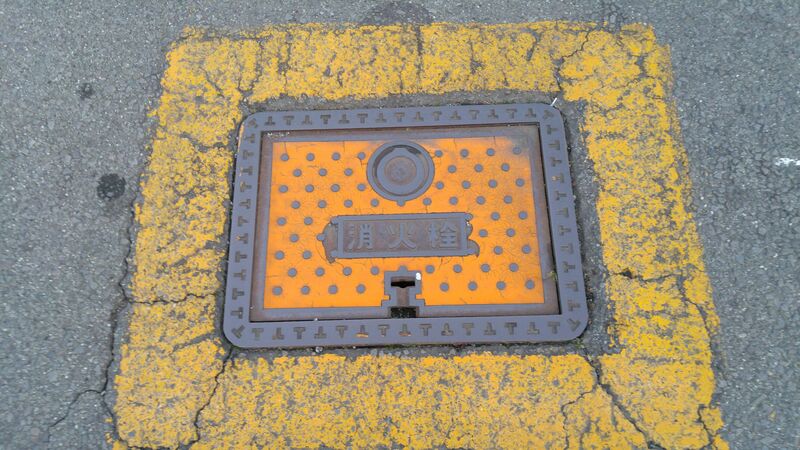 Small sized water valve cover! 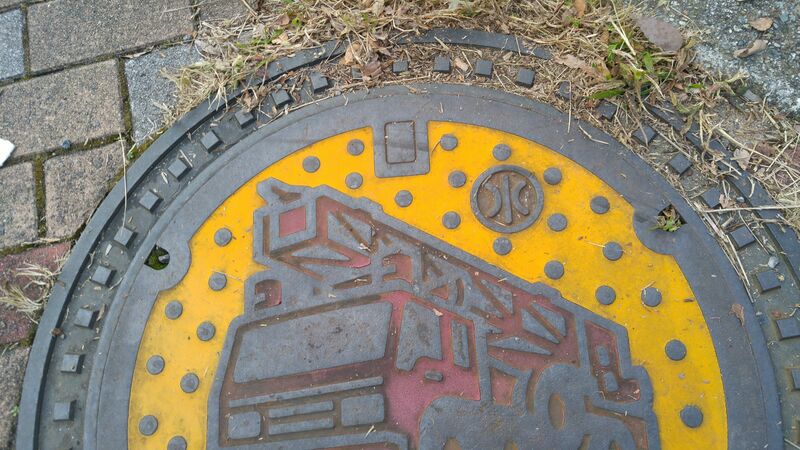 An even small valve cover! 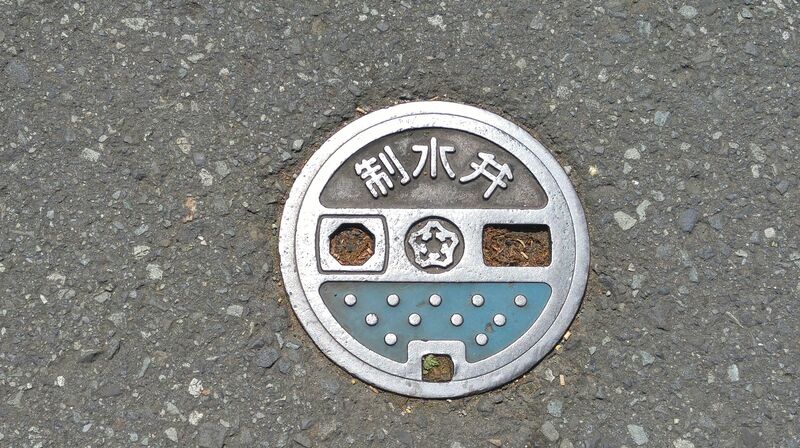 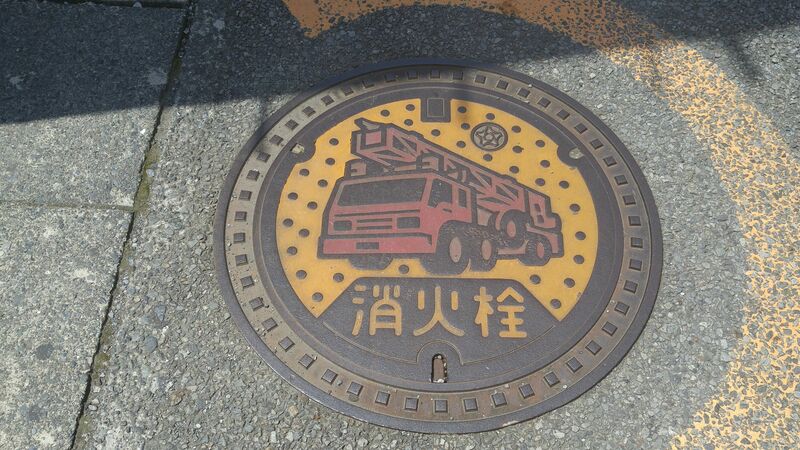 A rectangular fire hydrant cover found in many places but with the Susono City logo! 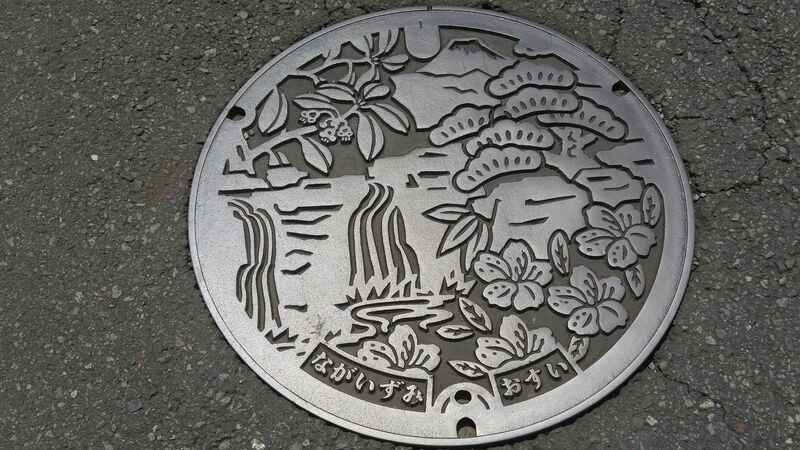 You will find other plain or geometrically decorated covers in town such as this rain gathering talk cover with the Susono City logo! 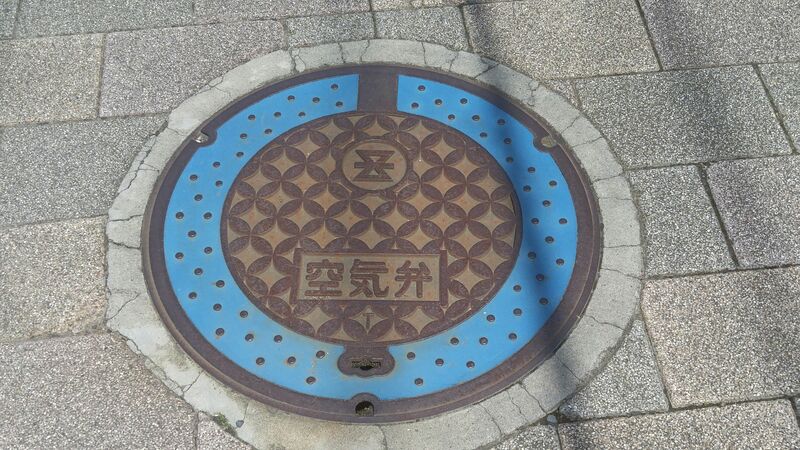 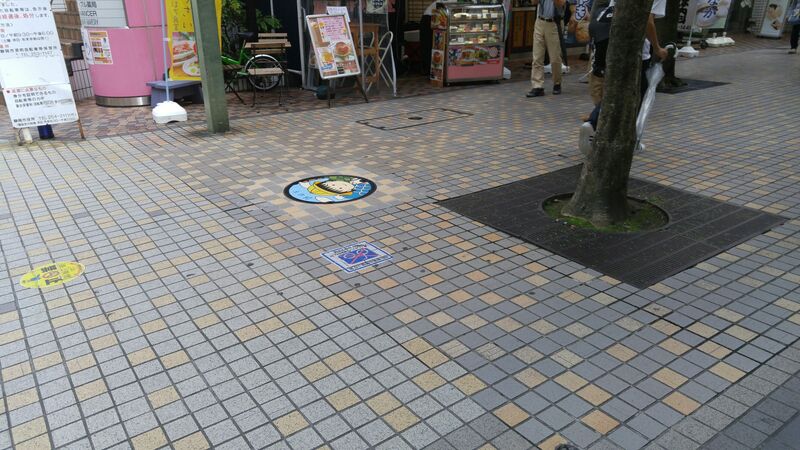 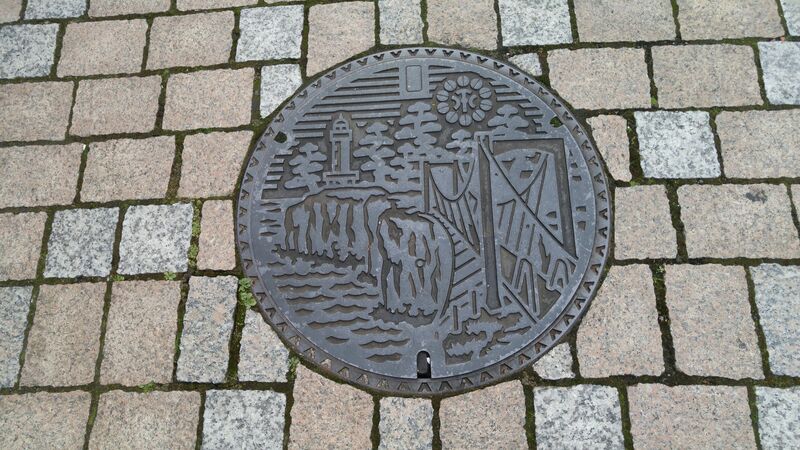 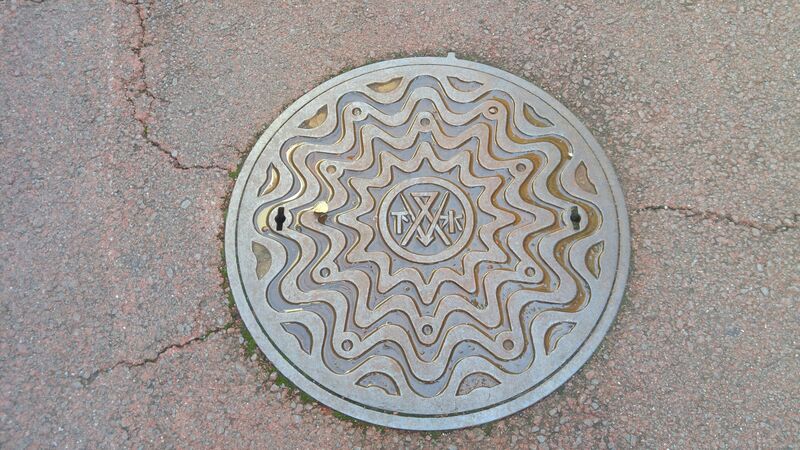 41) Manhole covers in Nagaizumi Cho! 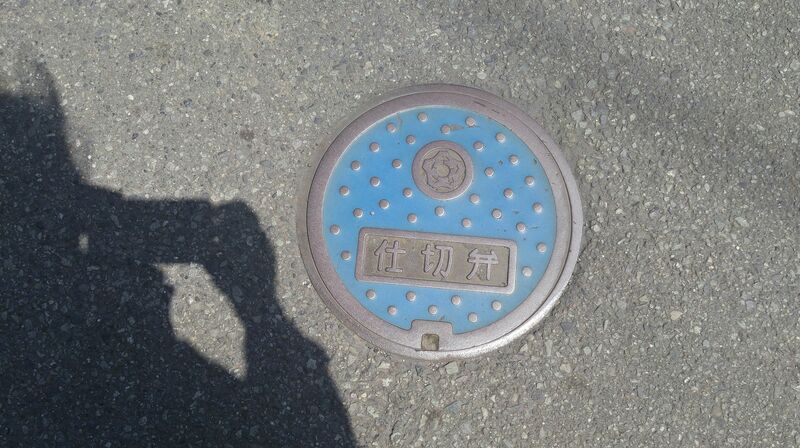 Nagaizumi Cho is still an independent area contrary to many other places which lost their names after being merged into bigger neighboring cities. 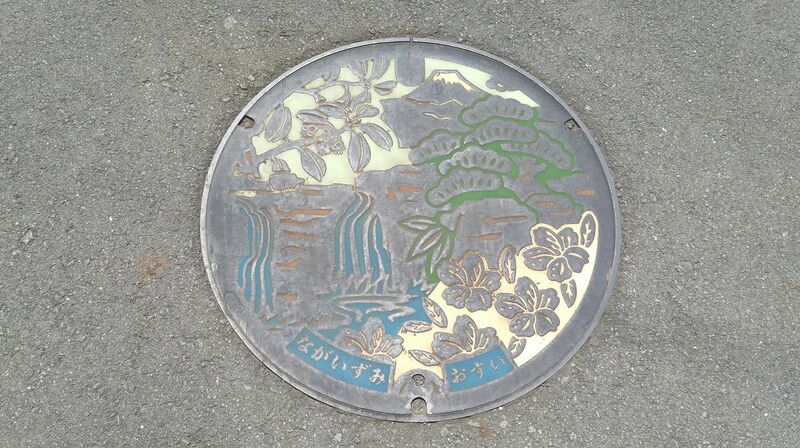 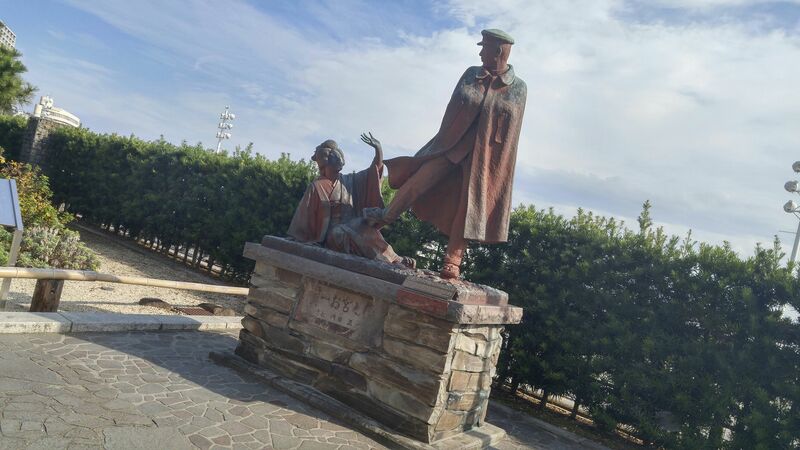 It is located along the Gotemba Railway Line starting from Numazu City Before Susono City. 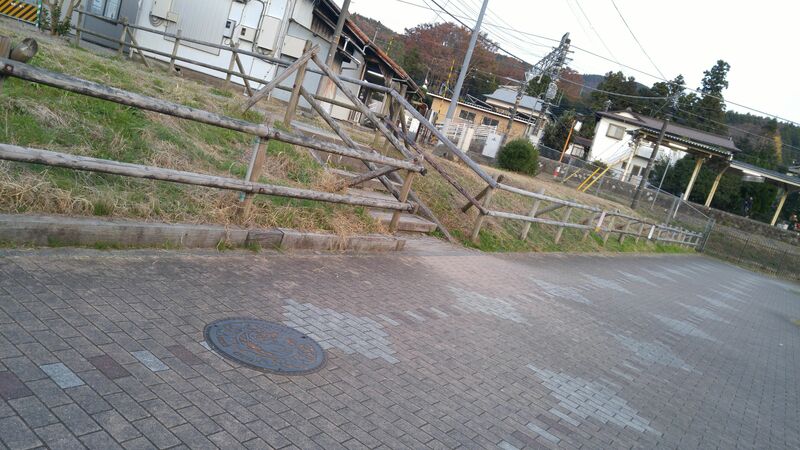 It proved a busier area than expected and I discovered that the mountains and nature were still a way from the station! 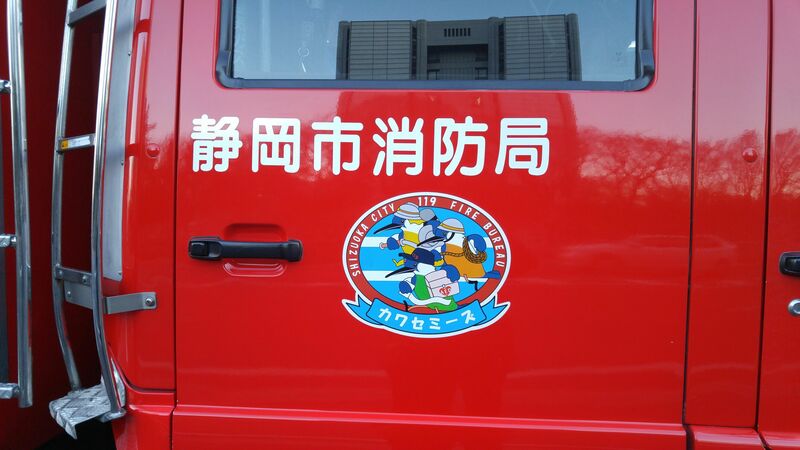 A splendid “matoi/纏/Firemen Festival Pole”! 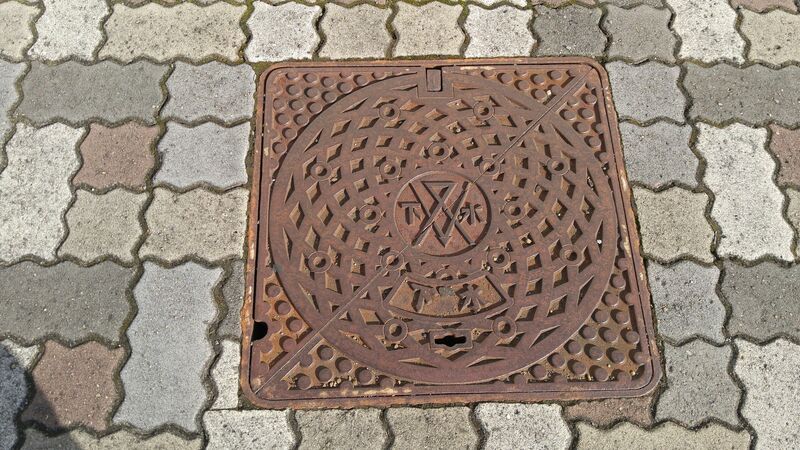 But when it comes to manhole, colored or neutral, they are all within walking distance from the renovated Railway Station! 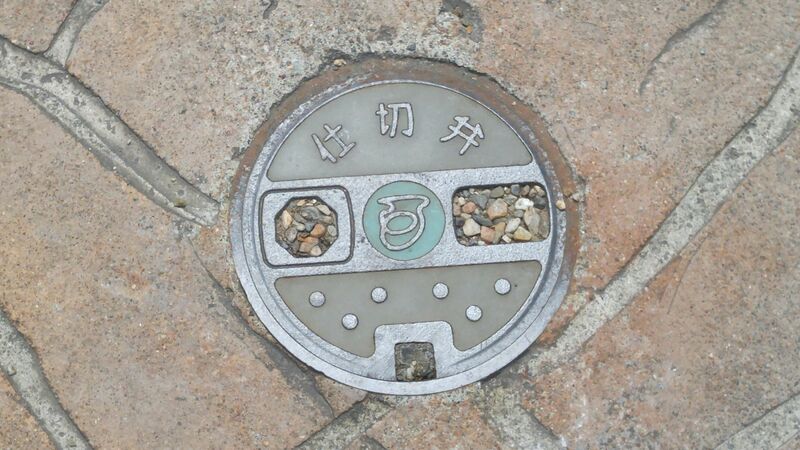 A small water valve with the Nagaizumi Cho logo! 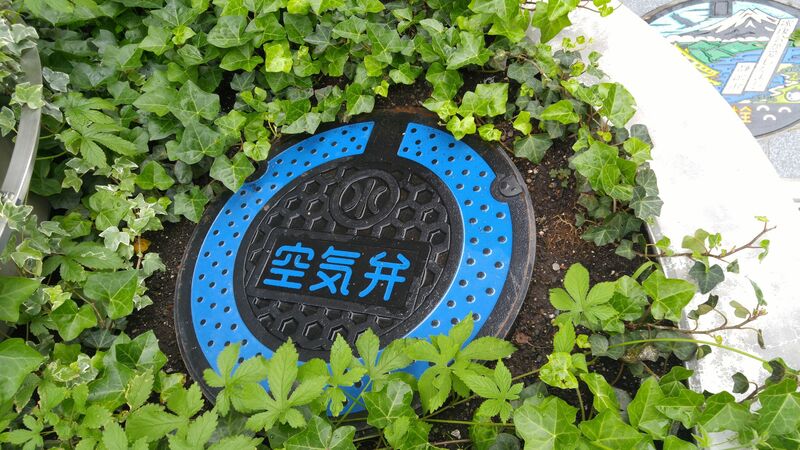 A medium-sized pressurized air valve! 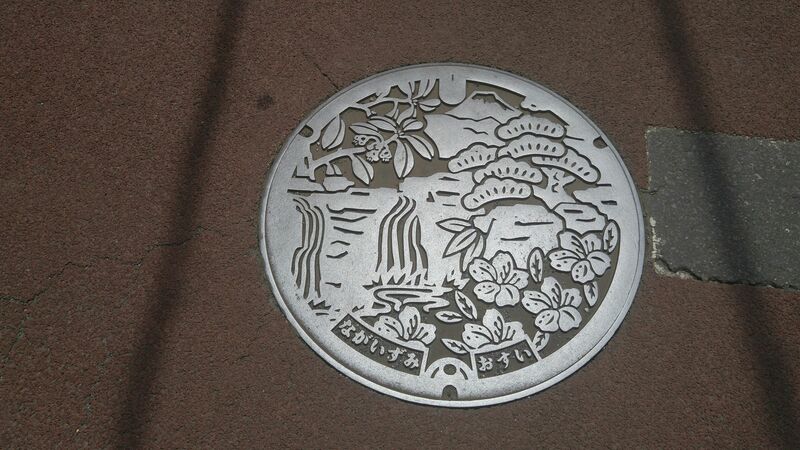 Getting near the purpose of this trip! 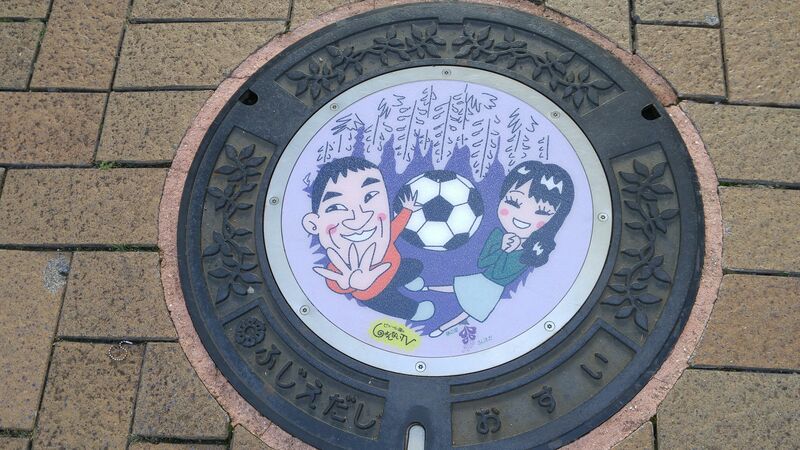 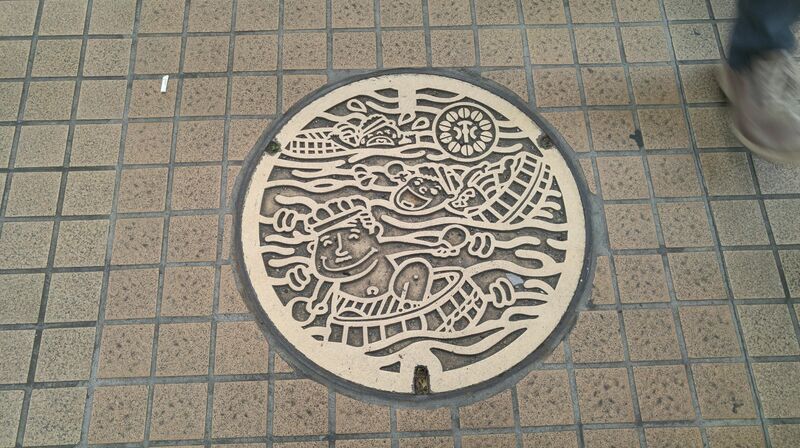 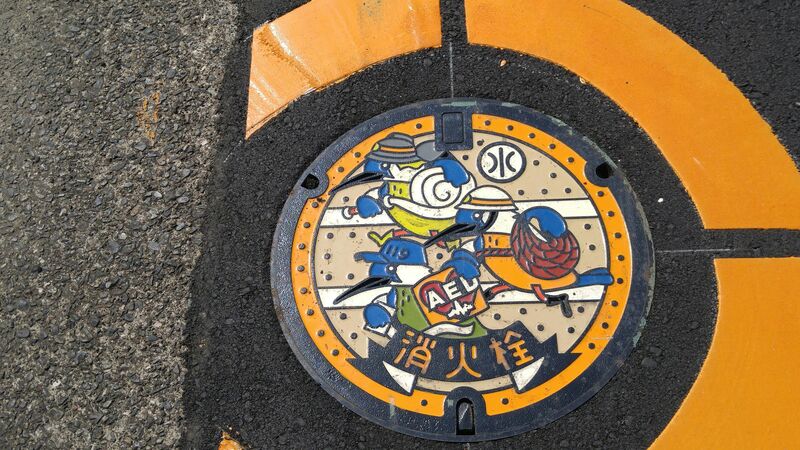 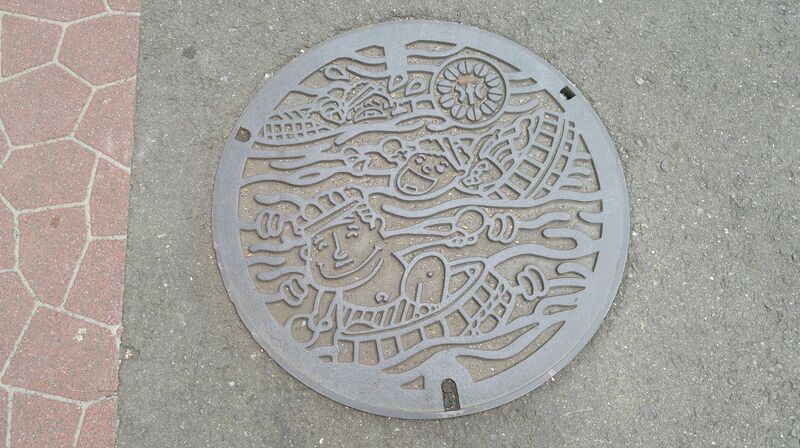 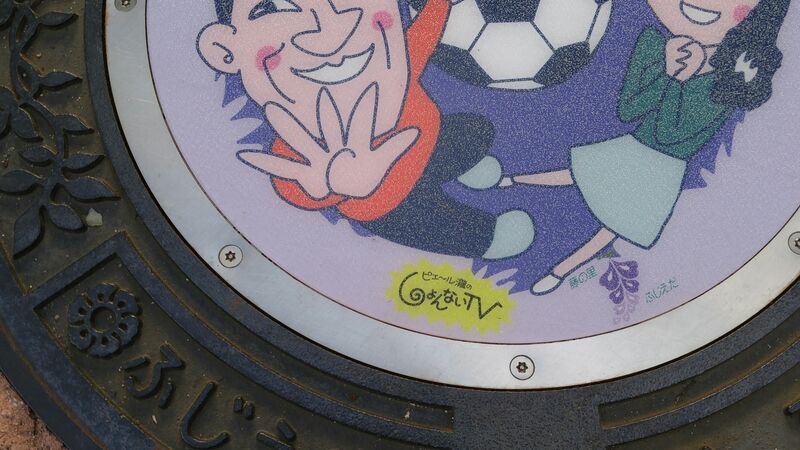 The official colored Nagaizumi Cho (sewers) manhole cover! 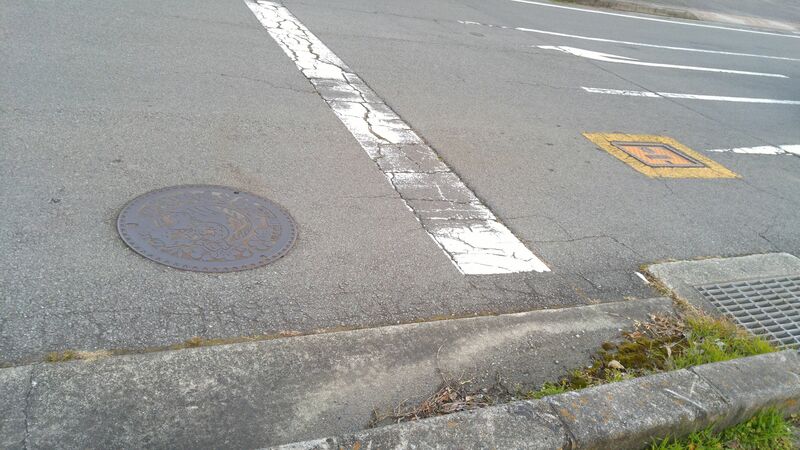 Neutral one again, but in medium size! 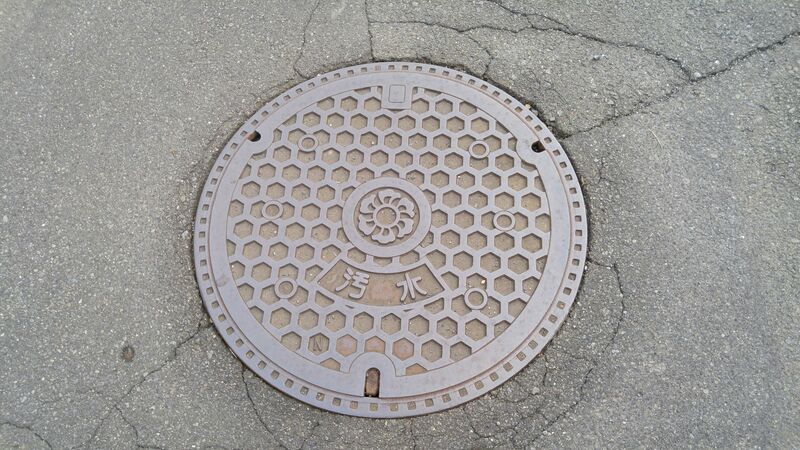 Neutral one, but in small size! 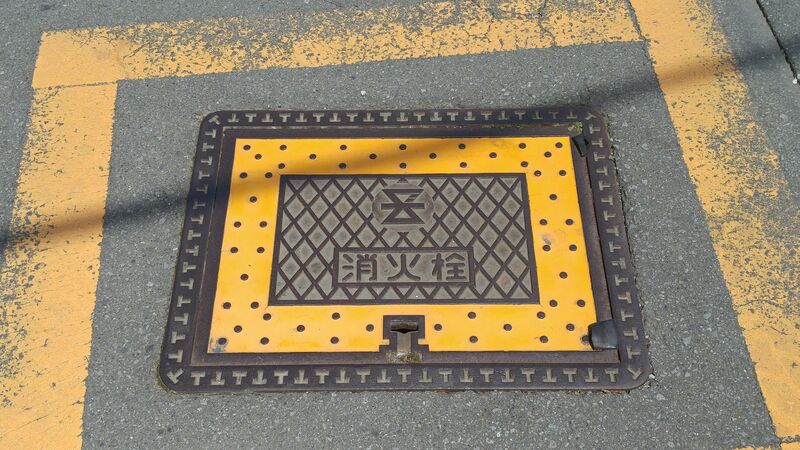 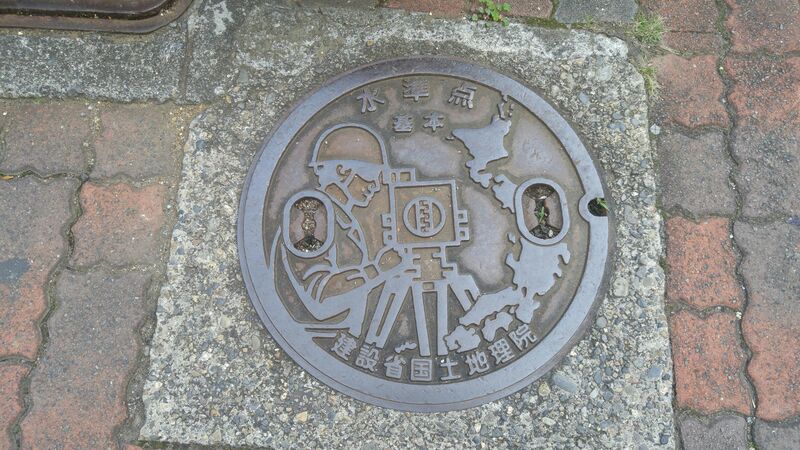 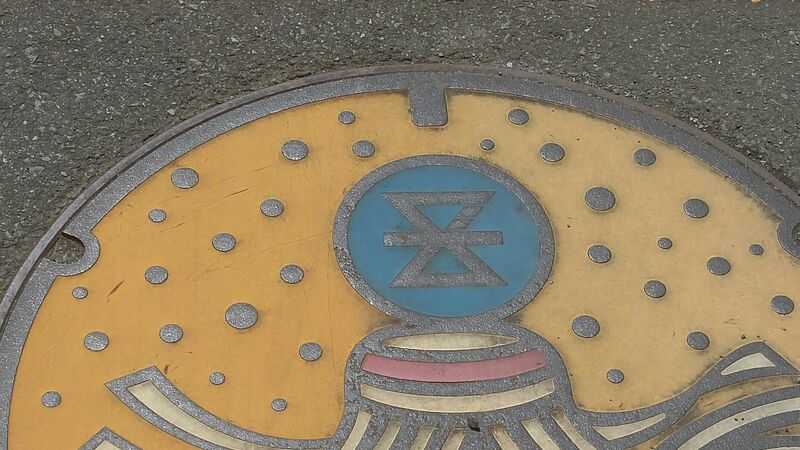 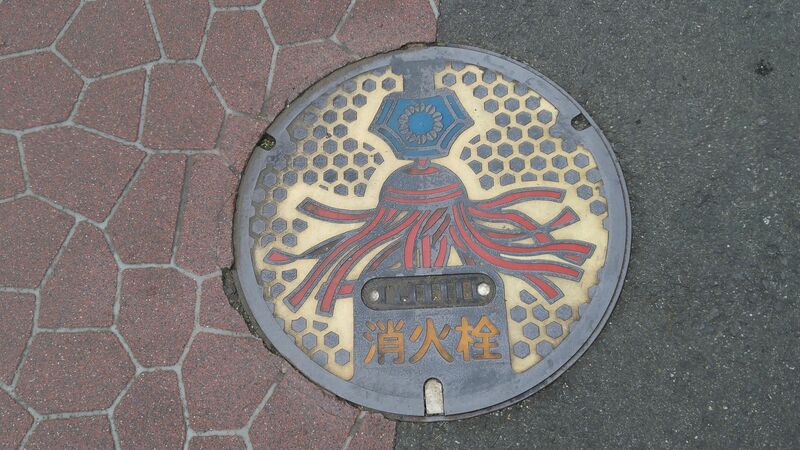 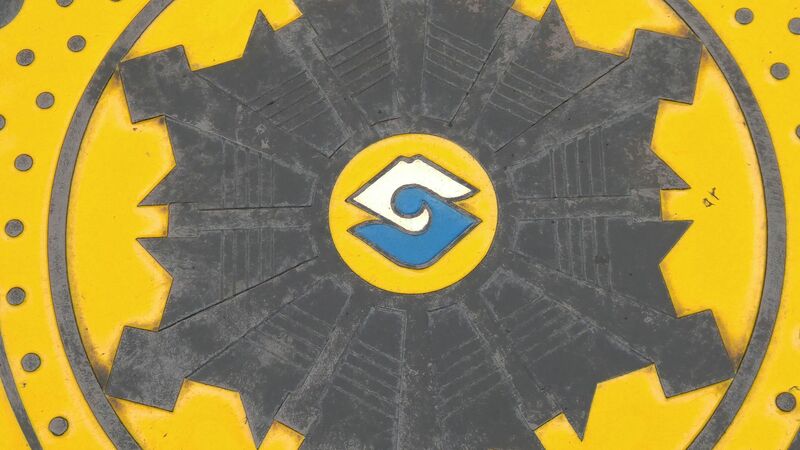 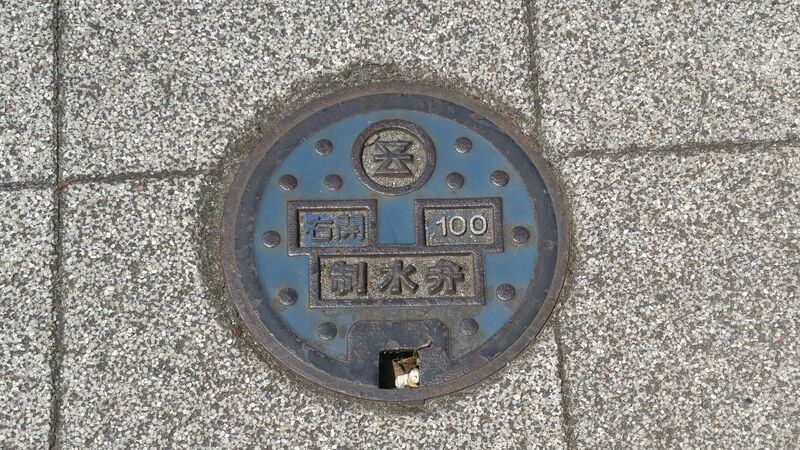 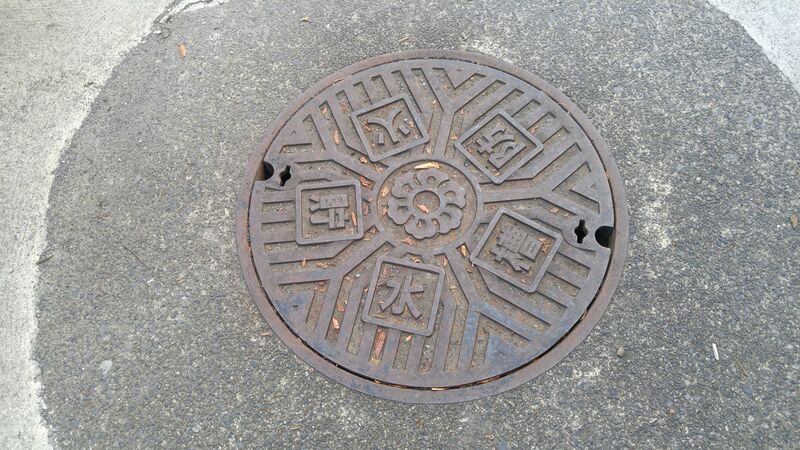 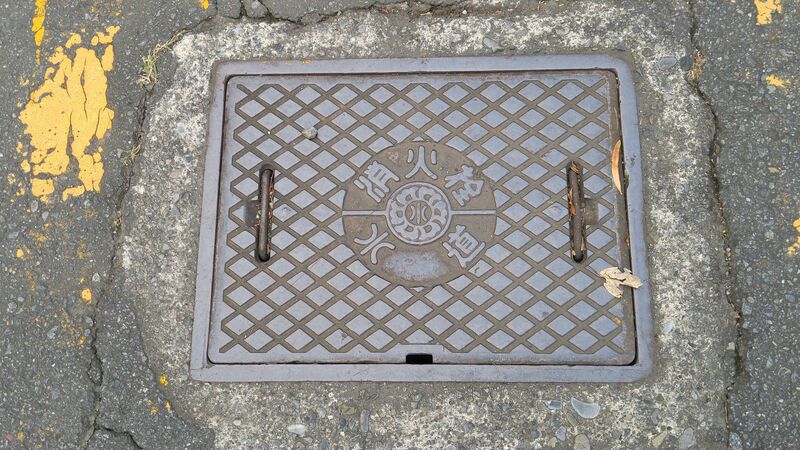 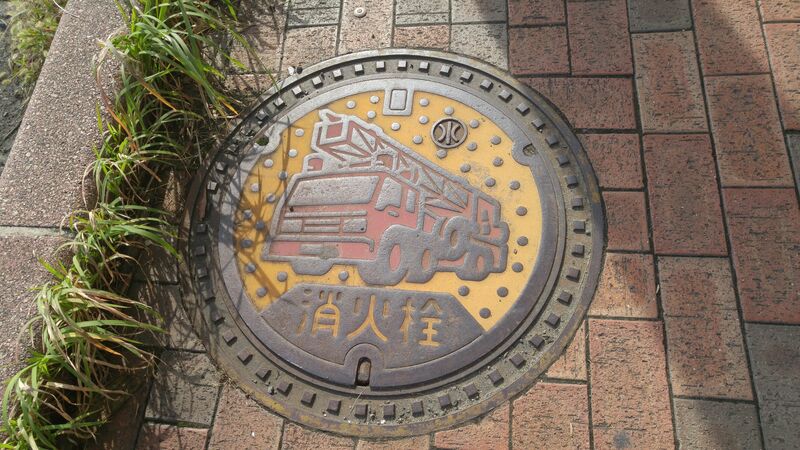 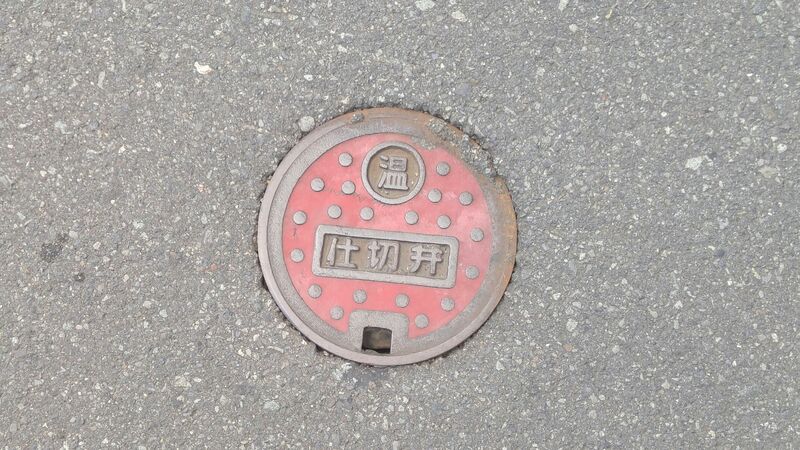 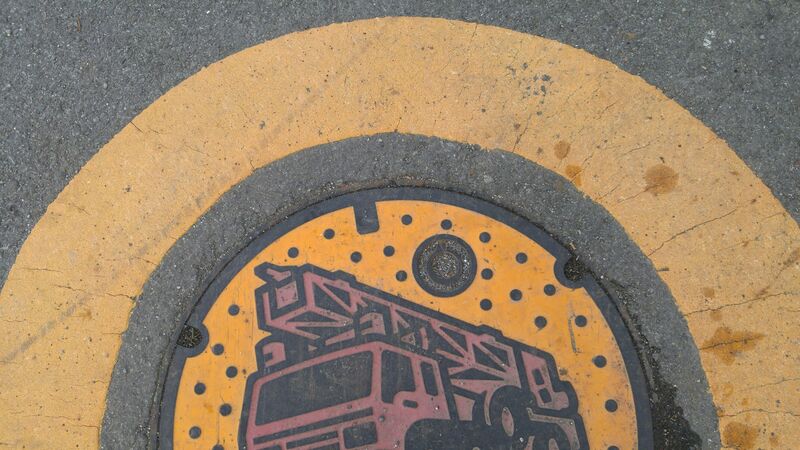 A rectangular fire hydrant manhole cover found all over Japan, but with the Nagaizumi Cho logo! 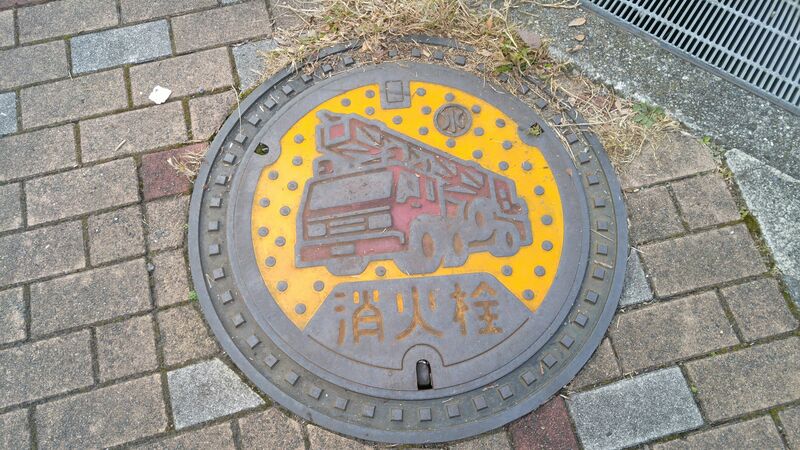 This “matoi” type fire hydrant is also found in many places, but with a difference!